It is completely illusory that to want to count the number of copies of the Eiffel Tower exists in the World, so much this monument was copied. 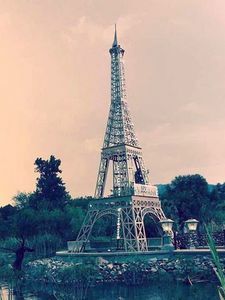 A small study shows that it is less than Statue de la Liberté, for which the list is nearly 400 replicas around the world (And again, it is obvious that it misses a good quantity), but the number of replicas that there is of the Eiffel tower is quite important. 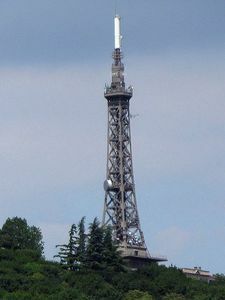 This number is directly proportional to the popularity of the tower and to what it represents: Paris, or France itself, depending on where it is represented. 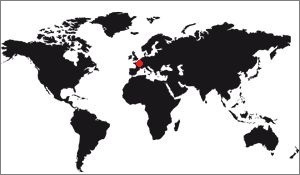 There are copies of all sizes in just about every country. The list below indicates the number of replicas that there is for a given country, by clicking on the line you will have the detail with an explanation of each one of these turns. We must distinguish two types of copies, which are presented here in the same way: There are the copies that want to be perfect and the inspirations. Perfect copies are copies to imitate the original as best as possible. 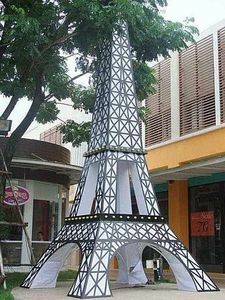 The largest of these copies is in Las Vegas, it is 1/2 scale compared to the real Eiffel Tower. The others have a little all sizes, to the work "human scale". The inspirations are metal pylons recalling the shape of the Parisian tower, but they are not intended to imitate it directly. Only the best known are listed below because we can not talk about copies to their subjects. But as many people think they are replicas, they are here. There are no purely private replicas, or too small ones. To be part of this list, it is necessary that the copy has a reasonable size and that it is in a public place, or at least easily visible of a public place. 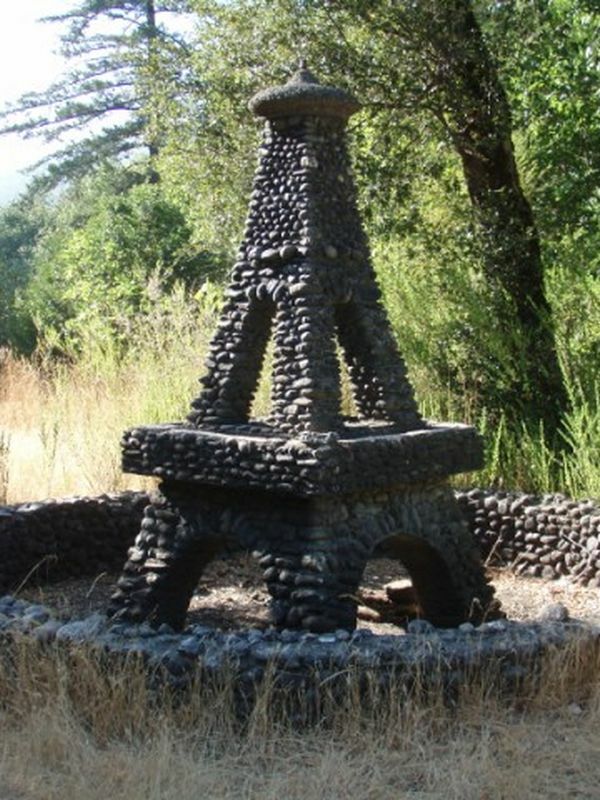 This is the case, for example, of this inhabitant who carved one of his cypresses in the shape of an Eiffel tower. 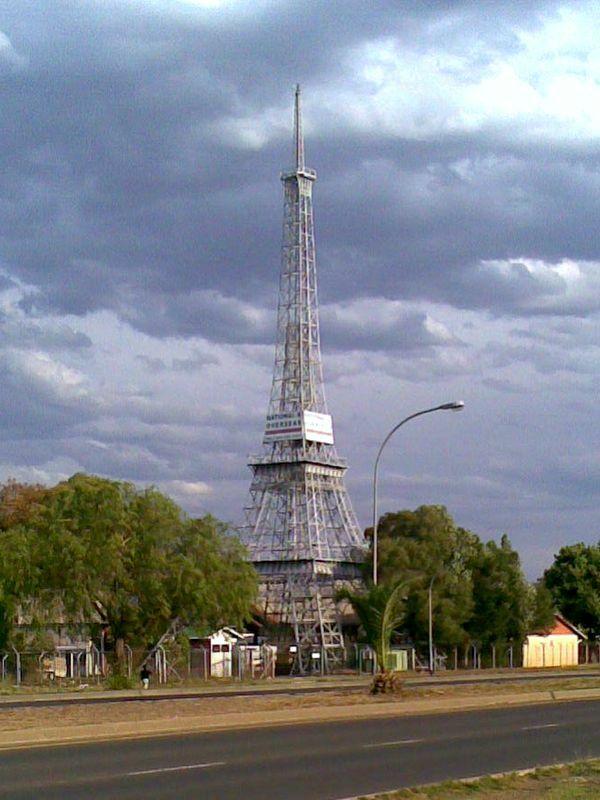 This imitation of the Eiffel Tower is in the city of Bloemfontein, South Africa. It is on the ground of the company "National and Overseas Modular and Timber Construction Ltd" which operates in the field of industrial construction since 1951, year of its installation on this site. The premises are in an industrial area on the outskirts of the city of Batho. Of course, the land is private, so it is impossible to approach, but its proximity to public space can be contemplated. 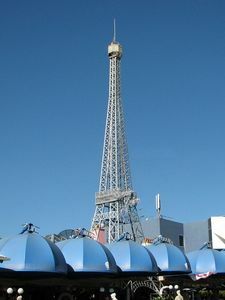 You can not ride on this tower, it is not planned for. The reason for its construction seems obvious, although we can not be sure: The Eiffel Tower is a masterpiece of civil engineering, for an industrial construction company, having a replica is a good sign. 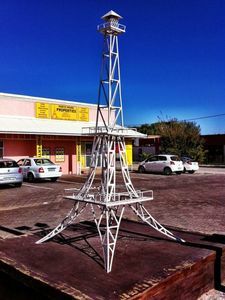 The replica of the Pretoria Eiffel Tower is a model of its kind. Near perfection, he lacks only two or three details like a third floor above or internal braces (hard to do, it's true) so that we can classify it in perfections. Even the 1st and 2nd floors are well reproduced. This tower is metallic, it measures almost 6m high. To make a more important criticism you have to look at the junction of the pillars at the 2nd floor: On the real Eiffel Tower the pillars join as soon as they leave the platform whereas this one shows a space between the pillars above 2nd floor, space that was filled by a trellis. 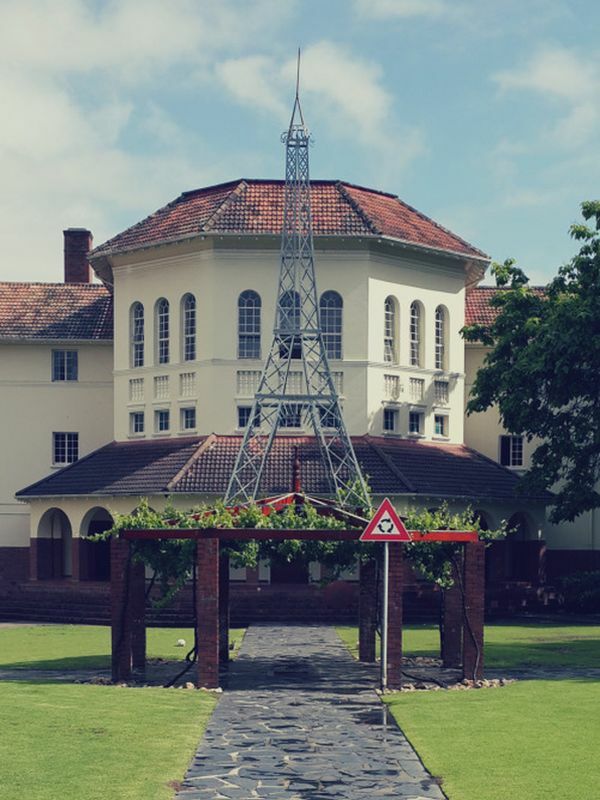 She is in the city of Pretoria, South Africa, in front of the Dagbreek residence on Victoria Street. 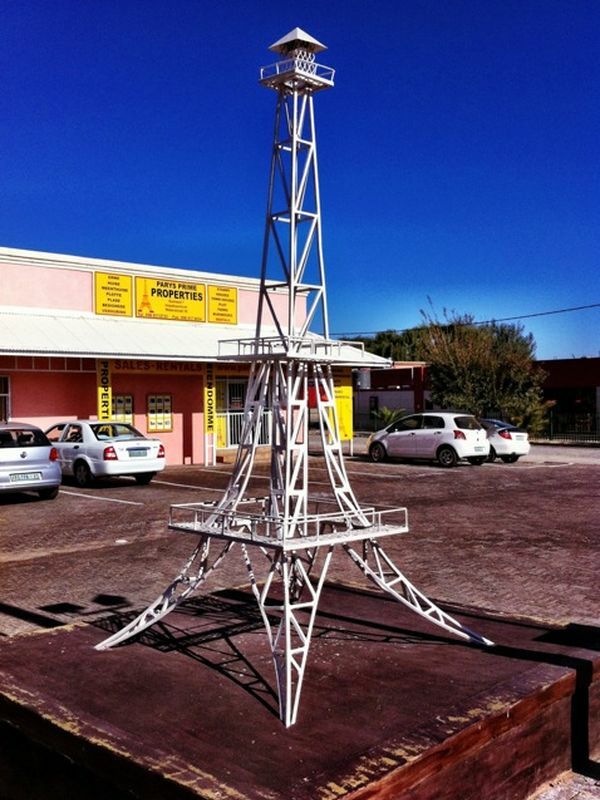 Cette Replica of la tour Eiffel se trouve à Stellenbosch, en Afrique-du-Sud. Elle est sur la devanture d'un hôtel ou d'une résidence hôtelière. Exactement, elle se trouve sur le toit d'une sorte de rotonde qui coupe un chemin piétonnier pour s'y rendre. La rotonde est en bois, c'est une simple construction qui parait bien fragile pour porter une architecture métallique de cette taille. This imitation of the tower is quite large, approximately 6m high. The general structure is fairly well imitated with the 4 pillars that join the level of the 2nd floor and the 3 floors well proportioned. The biggest problem is the lack of mesh thickness. On the real Eiffel Tower, the joists are much tighter, there are many more. This copy has just lightened architecture that can identify but is not a perfect imitation. This replica is in Hartebeespoort, South Africa. It was put in front of a French restaurant and as such, we have here again an example of the symbolism of the Eiffel Tower as a representative of France in the World. In fact it is the coffee that served as a backdrop to the film "French Toast", supposed to take place in Montmartre. Once the film was finished, the sets were partially taken over and a café actually opened. Next door a replica of the Eiffel Tower was built. 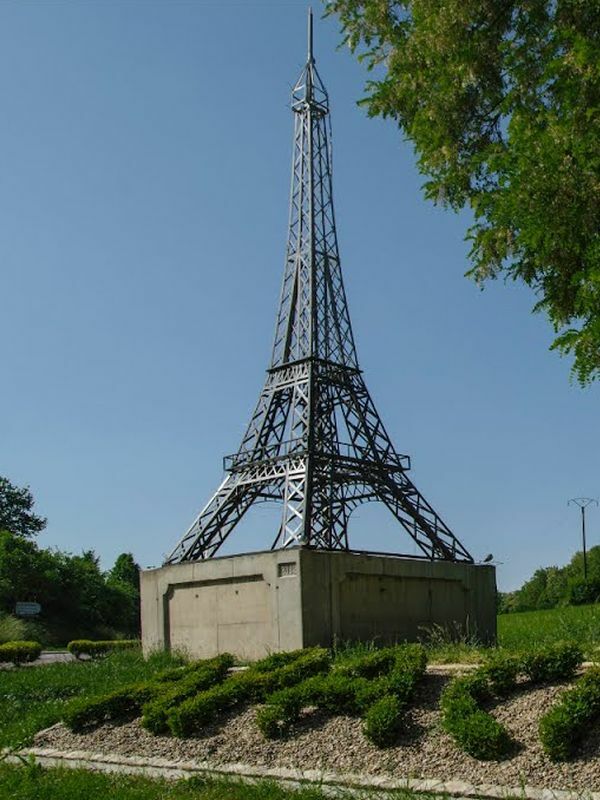 It measures 12m50 but it is not a replica complies: It has also a special interest because it shows what could have been the real Eiffel Tower if the pylon had left the 3rd floor instead of the 2nd . Indeed, the real Eiffel Tower is made of 4 independent pillars that join the 2nd floor, from which the pillars become a single pylon that rises to the top. This copy has its 4 pillars that join the 3rd floor, and suddenly the pylon is much shorter. Apart from that, she is quite successful, from a purely personal view. Germany has several copies of the Eiffel Tower on its territory. This one is in Berlin, in front of the Center Francais of Berlin, which was an institution of the French Military Government of Berlin, an instrument in the propagation of the French culture in the former French sector of Berlin Now become a hotel, the francophile past from the hotel is found in the structure imitating the Eiffel Tower found in front of the hotel. This is a very well done copy. It is not free of defects of course, but the general overview is good, it really looks like the original. Among the defects are the 4 pillars that do not meet on the 2nd floor as it should, and especially the pillars themselves which are simple parallelepiped instead of being a mesh of miniature beams, but we must admit that rare are the imitations that push the accuracy so far. 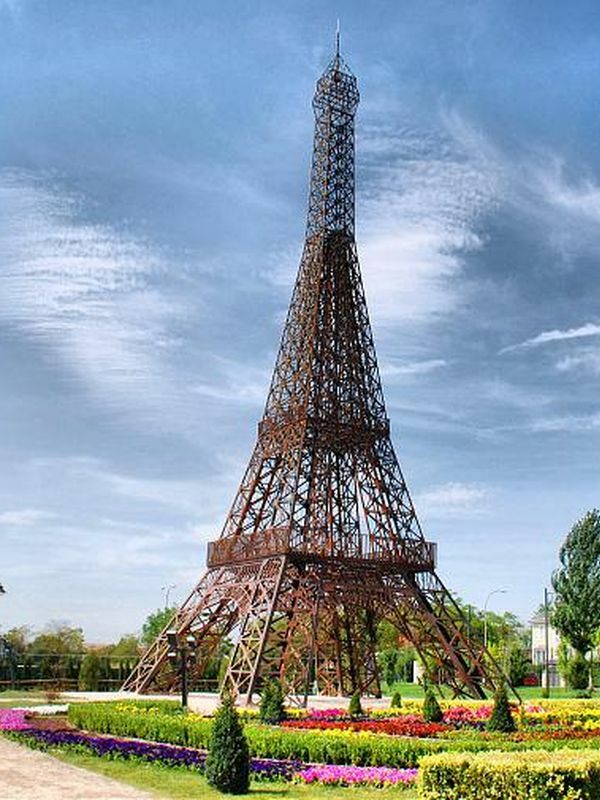 This metal structure is not really a copy of the Eiffel Tower but its architecture is clearly inspired. She is in Berlin, Germany. 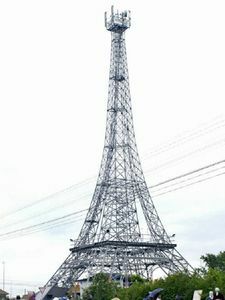 It is a large telephone pylon whose shape recalls the upper part of the Eiffel Tower, the one between the 2nd and 3rd floor. As such it does not have four separate pillars, which is a characteristic of the lower part of the tower, and its intermediate floor is of a very particular style. These are two large, enclosed and glazed galleries, perfectly square, large and superimposed. As we see in the photo it is the lower gallery which is the smallest. The top of the tower also has an observation gallery and it is probably this one that is the most similar of the 3rd floor of the Eiffel Tower. 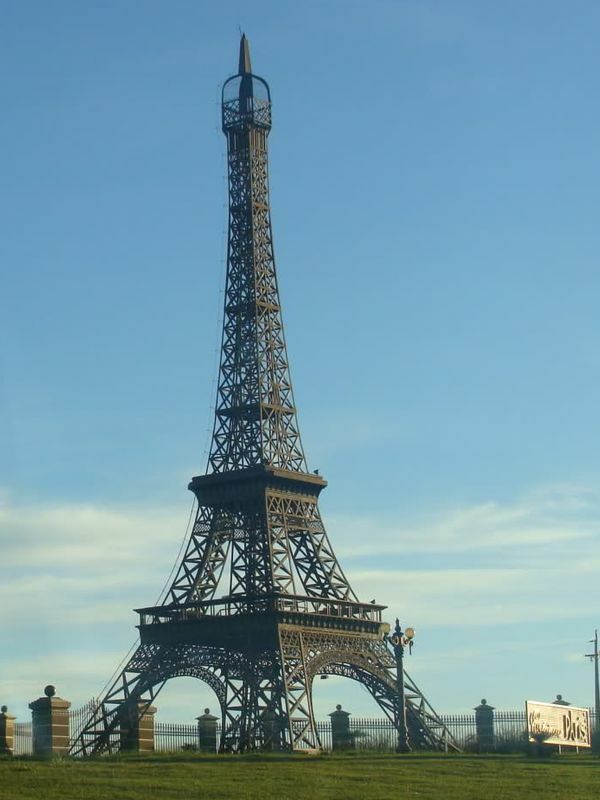 This tower is classified in the copies of the Eiffel Tower but the imitation is quite weak. 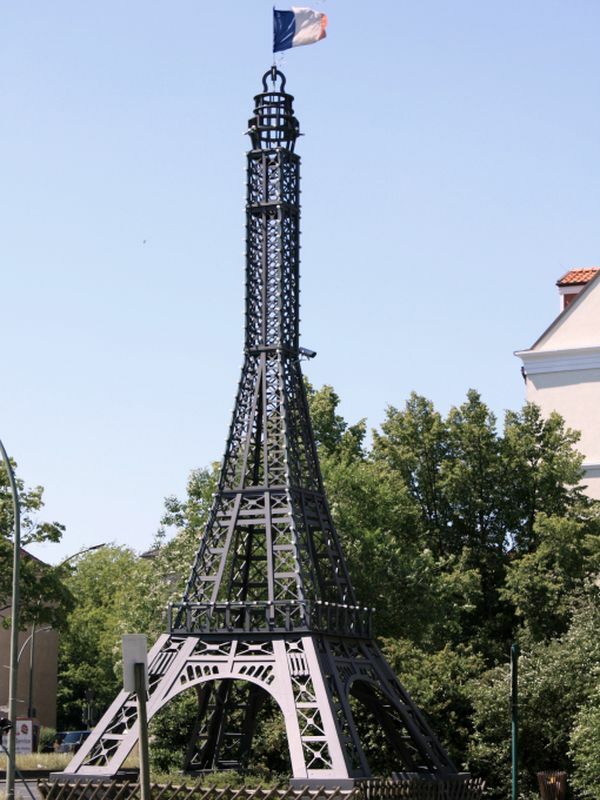 This replica of the Eiffel Tower is undoubtedly the most successful one that can be found in Germany. It is on the roof of the "Rungis Express catering company" in the city of Satteldorf, near Crailsheim. 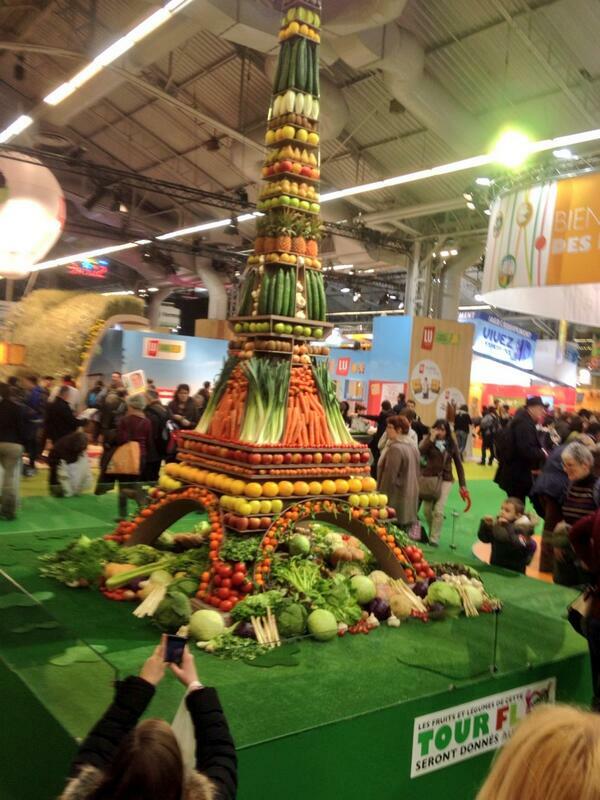 We must see in the presence of the tower here a relationship with the city of Rungis in the suburbs of Paris. 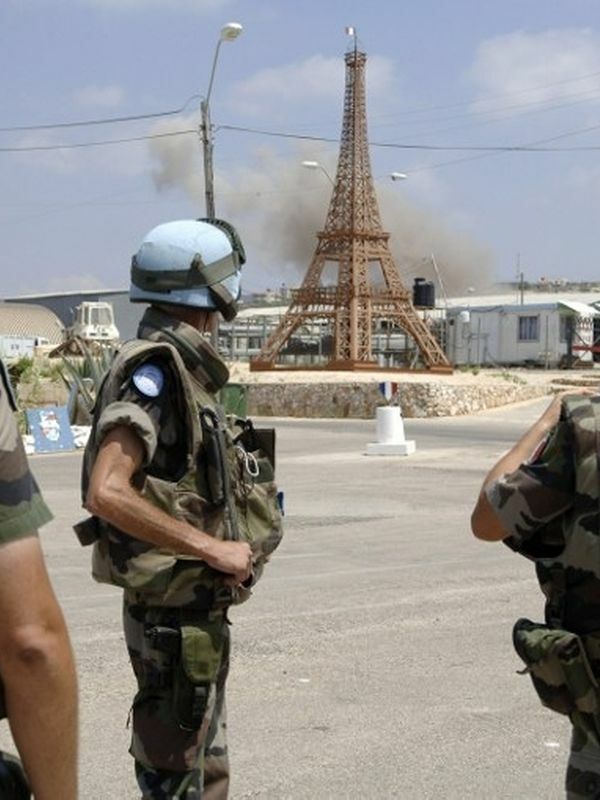 This company is probably French and the French had to import this tower which reminds France on the spot. This is a very nice replica, good quality. The proportions have been well taken and there are even decorative bows, certainly simpler than the real trick, but really interesting. Only the third floor is not very similar, and again, other copies are much less than that. This replica is well known, it is part of the main replicas of the tower. The AWA Tower is located in Sydney, New South Wales, Australia. It is an office building that was built in 1939. 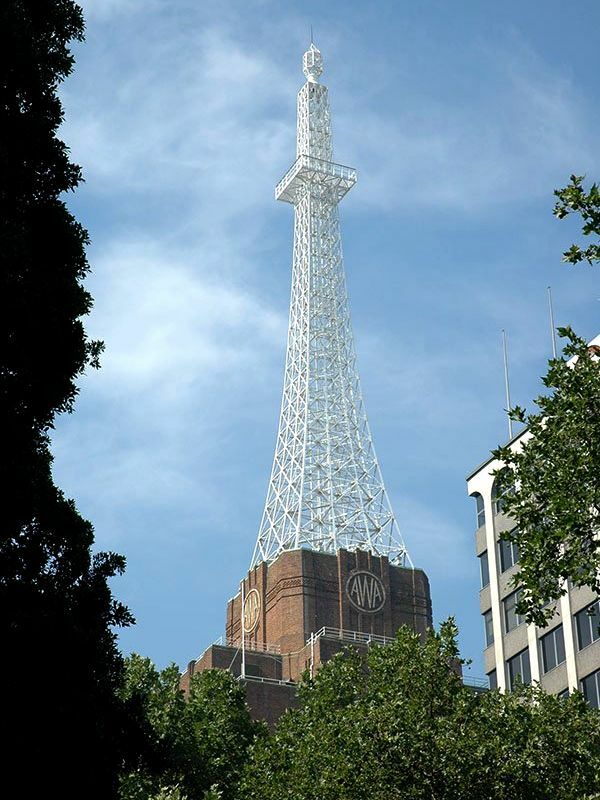 In order to circumvent the restrictions of the maximum height of the buildings in Sydney, the owners chose to build a transmitter. The chosen shape is inspired by the Eiffel Tower, although the resemblance is not striking. It was for a long time the highest construction of Australia. 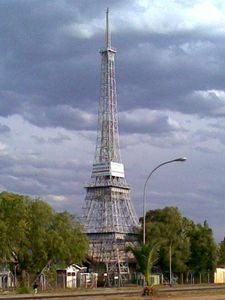 It is square, and its mesh is uniform and dense, which gives an imposing effect, unlike the Eiffel Tower which, it is rather aerial. The intermediate floor is an open platform, a kind of balcony with a guardrail. The tip is typical with its ogive shape. 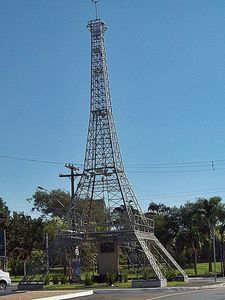 This copy of the Eiffel Tower is in Brisbane, Queensland, Australia. She is on the roof of the café "Rue de Paris" who wanted to remember the French origins of the establishment. It is in the Milton area, for those who want to go there. This tower was completed on December 8, 2013, so it is relatively recent. 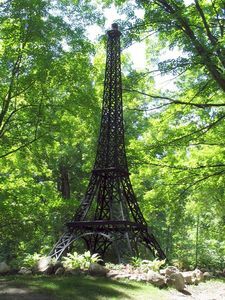 This copy of the Eiffel Tower is in the Minimundus Park in Klagenfurt, Austria. This park presents miniatures of the main monuments of the world, there is a little bit of everything. The site on the statue of liberty lists one, for example. 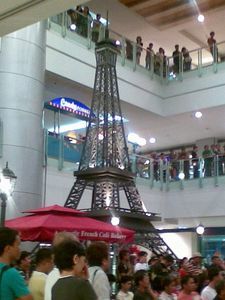 Here, the Eiffel Tower that interests us is at the scale 1:25th, so it is 12m high. It is relatively well done, which is quite rare because many copies are not compliant. This one has parallelepipedal and not flat pillars, as it is often the case, the spacers are well reproduced and the perfect stages (With the exception of the pavilions of the first floor, absent). Beyond these details we must note the curvature of the tower, perfect, and the position of the floors well reproduced. Often they are where too high, or too low. The only reproach that could be made to him is not specific to the tower itself, it is the small flags of all the countries which decorate it and which are absent from the original tower, but it is good to find something wrong because this tower is a perfect copy of the original. Baku is the capital of Azerbaijan, in the east of the country. 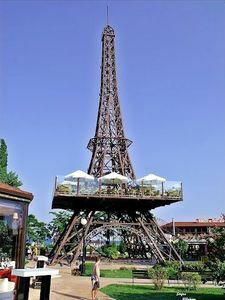 The city has a replica of the Eiffel Tower about 3 meters high, at the Sahil shopping center, at the entrance of the "Parfums de France" shop. We do not know why it was built. 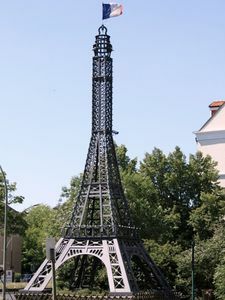 This replica of the Eiffel Tower is in Brussels, in the Mini-Europe Park. 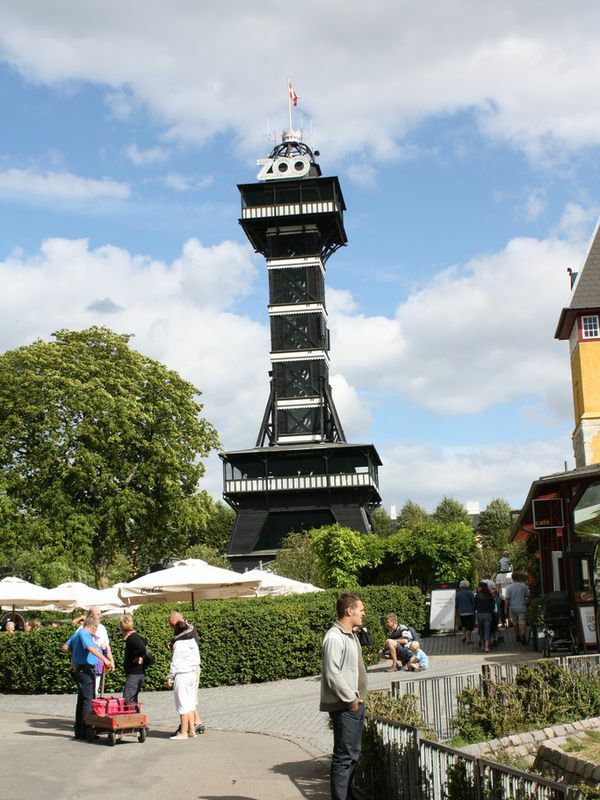 It is an amusement park with 350 miniature European monuments. This is not a park so original that since there are several on this theme everywhere. This Eiffel Tower is particularly well reproduced, it is a true copy ... what it is not. 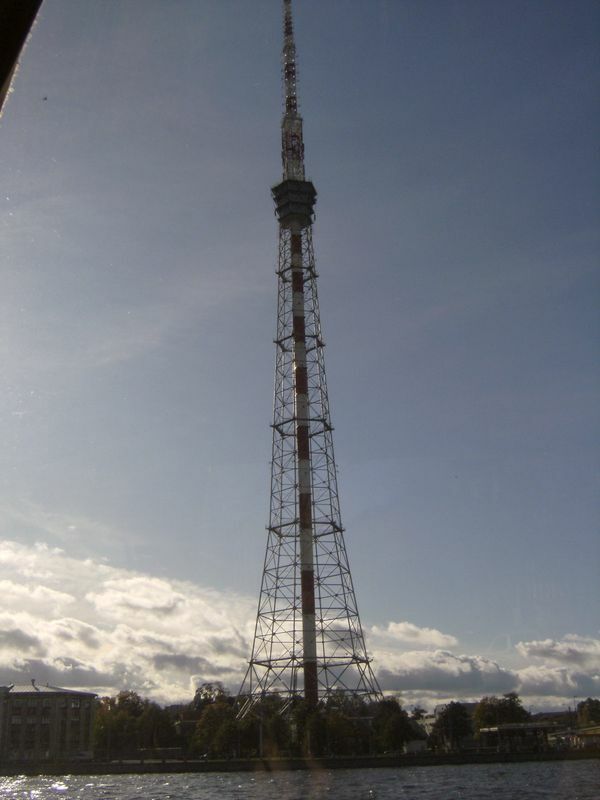 The main defect is at the top, at the antennas, whose size and shape does not correspond to the reality of the tower. The 4 metal arches that hold the antenna do not exist either, but they recall the shape that the tower had in 1889, at the time of its inauguration. There is another flaw, namely the fact that the pillars do not quite join the 2nd floor but higher, whereas on the real tower, the 2nd floor really serves as a place of joining of the 4 pillars . Otherwise you have to admire the precision of the reproduction: The beams, the decorations, the floors are all very well done. This copy measures 13m96 and is 1:25 th. 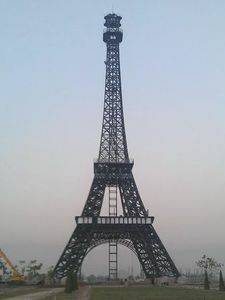 Here is a copy of the Eiffel Tower far from the original! It is in the city of Sucre, Bolivia. 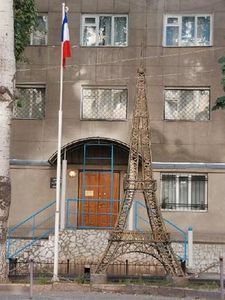 This country has received several buildings built by Gustave Eiffel, including the central station of La Paz. The city of Sucre, at the beginning of the 20th century, ordered this strange tower from the contractor, so Gustave Eiffel designed it. It has been used for a time as a weather station, and it is installed in Bolivar Park. The resemblance to the Parisian tower is not obvious ... 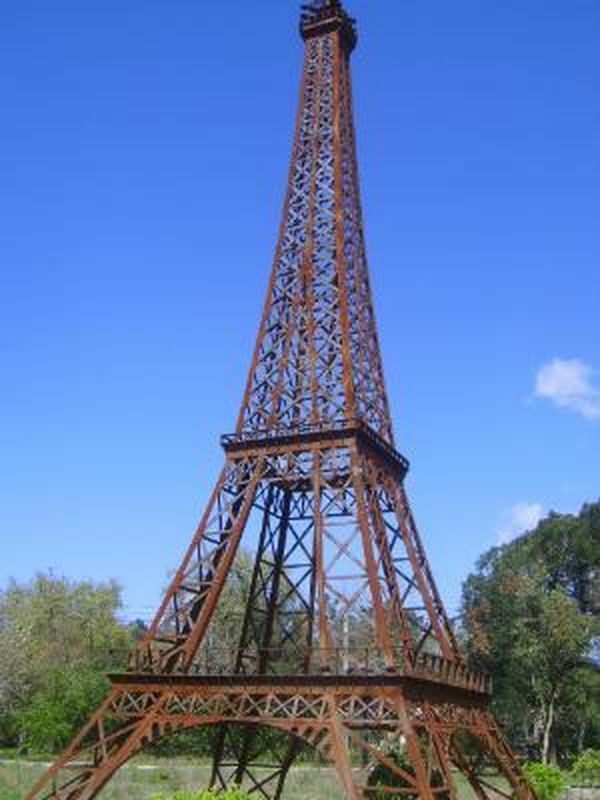 It must be considered as a tower having nothing to do with the Eiffel Tower, then notice similarities: Thus the materials used are identical, the techniques of mounting too, with riveted braces for example. The two floors are reminiscent of the original tower, as are the four pillars whose curvature is similar to the decorative arches on the first floor. Finally there are two important elements that bring together the two towers, but that we have forgotten nowadays: The spiral staircase, now dismantled on the Eiffel Tower, and the campanile-shaped top, also replaced by a more classic, square peak. But at the time of the construction of this tower the similarities were more visible than today. This is a very amazing copy of the Eiffel Tower! 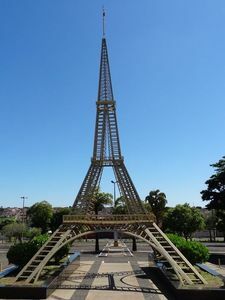 It is located in Rio de Janeiro, Brazil, in front of Barra World Shopping and Park, a shopping center. It is not badly reproduced at all, of a very large size, but it is ensuites in the middle of Haussmann buildings very surprising in this country of Latin America. No doubt the promoters wanted to highlight France, and what better emblem than using the Eiffel Tower? This tower is well reproduced, it is perhaps a little too dentellée on its upper part, but the lower part is well reproduced, especially the stages, difficult to make. What is wrong is the curvature of the tower that bends in the middle of the upper part, while on the real tower it starts pyramid from the 2nd floor. A small defect quickly forgiven given the quality of this reproduction. Bauru, in the province of São Paulo, has in the city center a copy of the Eiffel Tower very stylized. 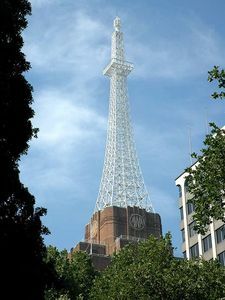 It does not want to be a true copy but rather a proposal for modernization of this tower. Much more flared at its base, it rises to the sky by a succession of stages more and more inclined. One of the original elements is the fact that the pillars meet at the 3rd floor, while the real tower is the 2nd, which leaves this 3rd floor still low enough to make a 4th floor that was not actually materialized. The city of Brasilia has built a rather ordinary radio and television pylon that some compare to the Eiffel Tower. Let us leave it then in the copies of the monument, but the resemblance is still quite far away. They share the fact of being a metal architecture and to be visited, with an observation platform at 74m altitude that attracts 300,000 visitors per year. 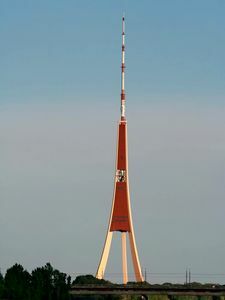 The pylon, in total, still measures 224m high, it is the tallest building in the city. Rio Claro is a city in the province of São Paulo, Brazil. 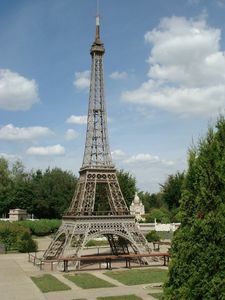 It has a large and very pleasant park in which the visitor can see this imitation of the Eiffel Tower. We feel that it was made by professionals, but that it was not a question of reproducing it in exactly the same way, just to mark a symbol in this place. It has a generally correct shape, the spacing of the pillars, the height of the floors is good, and there are even some decorative elements of the first floor. 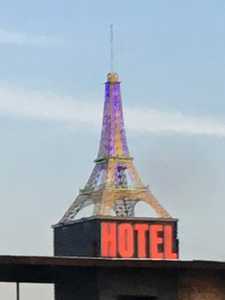 By cons, the 2nd and 3rd floor are missing, and especially it is made of simple metal bars, such as an electric pylon for example, where the Eiffel Tower is made of a kind of metal lace. It must still be appreciated because it deserves it, even if it does not postulate the position of the most beautiful imitation of the world. It measures about twenty meters high, roughly. 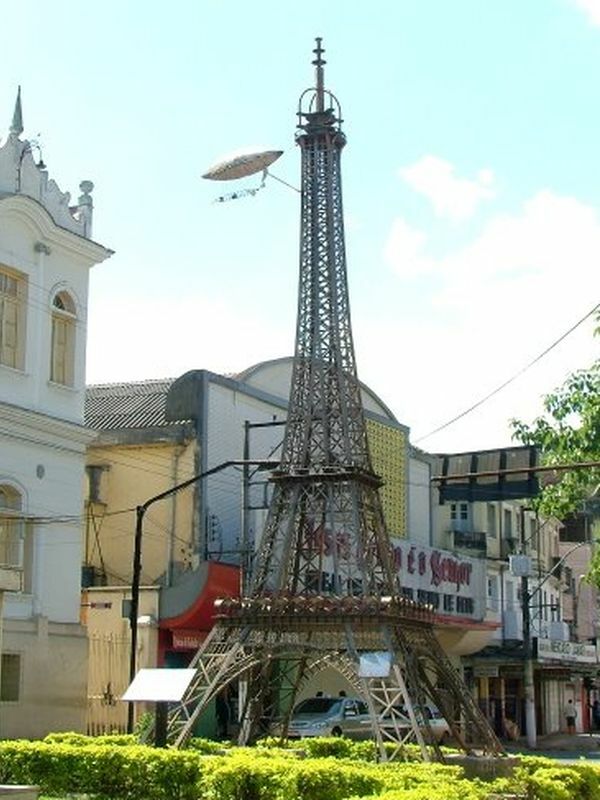 The city of Santos Dumont in the state of Minas Gerais, Brazil, also has its Eiffel Tower. It is 7m high for a scale of 1:50 th. This city was formerly called Palmira, it was the hometown of Alberto Santos Dumont, a famous Franco-Brazilian aviator. This replica was built in 2001 to celebrate the 100th anniversary of the flight of the aviator around the Eiffel Tower, hence the presence of a small airship hanging on top. This replica with an originality about its sisters: It was reproduced as it was in 1889, at the time of its construction. And the bet is successful, this replica is really well done. What marks the most are the galleries of the first floor, with arches, architectural elements that were removed in 1936 during a renovation. The campanile is also reproduced as it was at the time, although this summit is not the most successful. Otherwise, the rest is not bad because: Proportion, curvature of the pillars, spreading floors, etc. 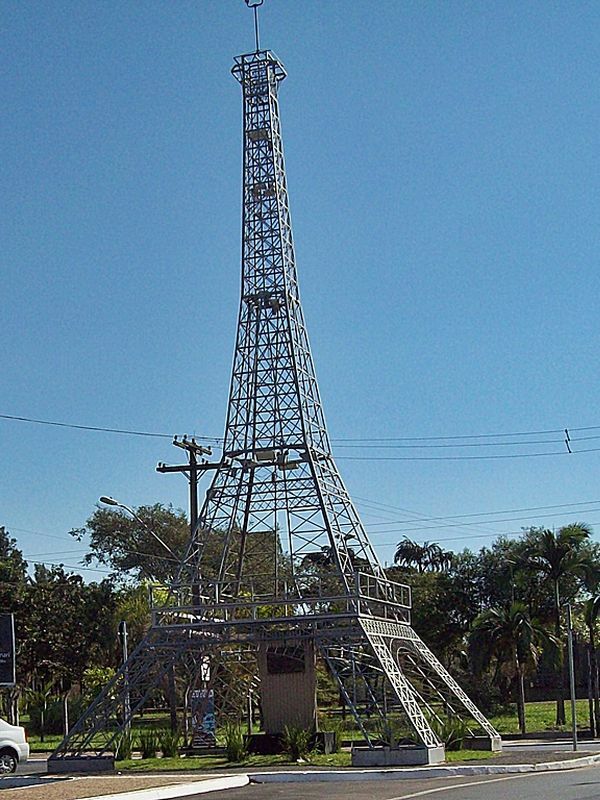 It is in Umuarama, in the state of Paraná (Brazil) that we find this superb replica of the Eiffel Tower. Why is she here? Who built it? It is unknown, but the panel at his feet on which we see the word "Paris" is reminiscent of a kind of commercial area specifically French which would have needed a strong symbol. Of course, the Eiffel Tower was chosen. This replica is rather successful: Its pillars are indeed paraléllipipèdes (It is rare, mostly only the outer sides are made), the floors are very worked, to reproduce the decorations under the sides of the floors, and the lattices are perfectly reproduced. Only the summit is strangely missed: It does not correspond to the current reality of the tower, or the bell tower that was created at its inauguration in 1889. Congratulations to the designers of this very successful imitation. As an imitation of the Eiffel Tower it does not enter the top 10 best copies but we must salute this desire to make it as perfect as possible. Thus the curvature is well respected, the pillars are massive, as it should, the position of the floors is correct. We can regret the 2nd floor, baclé, and the absence of the 3rd, because if it had been there the resemblance would have been a blow more flagrante. Hat still to designers and builders, because they were up to reproduce the decorative arc of the pillars. 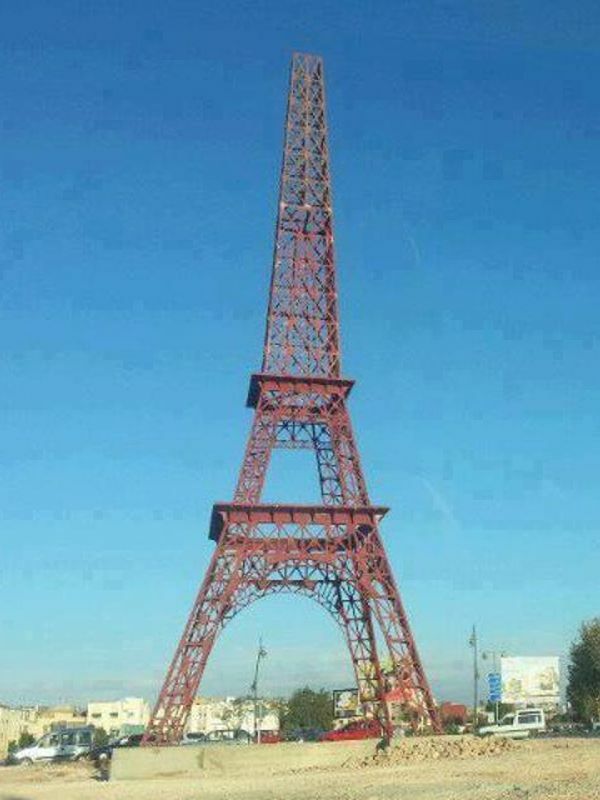 When individuals pay tribute to the Eiffel Tower ... It gives Eiffel Cypresses very successful! 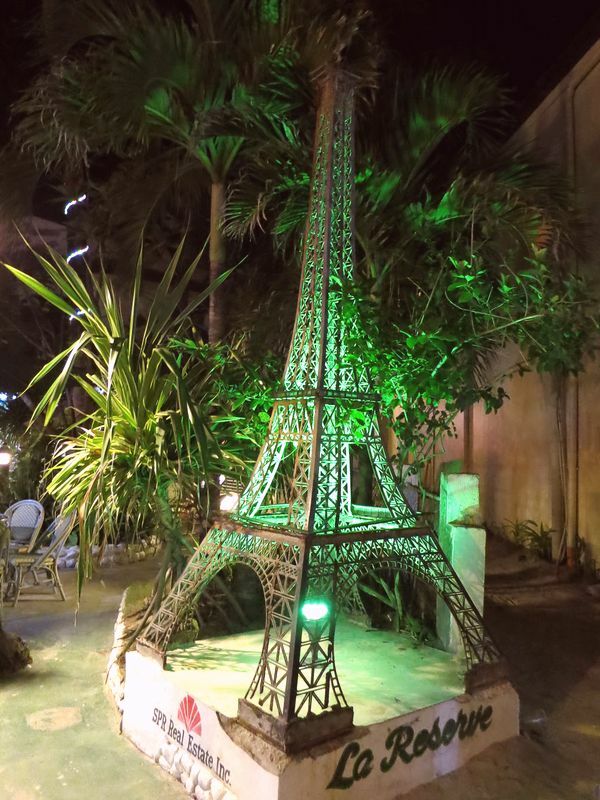 Obviously the resemblance to the real Eiffel Tower is quite relative, but the efforts to obtain such a tree deserves our congratulations! This is a cypress tree seen on Lechasseur Street in Beloeil, Quebec (Canada). She is in a private garden, but the fact that she is seen from public space allows her to be on this website. Technically it is a single tree, a cypress, which grew on a metal canvas. These are probably the floors that are the most difficult to carve, they are barely marked, except the 3rd which is still well reconstituted. 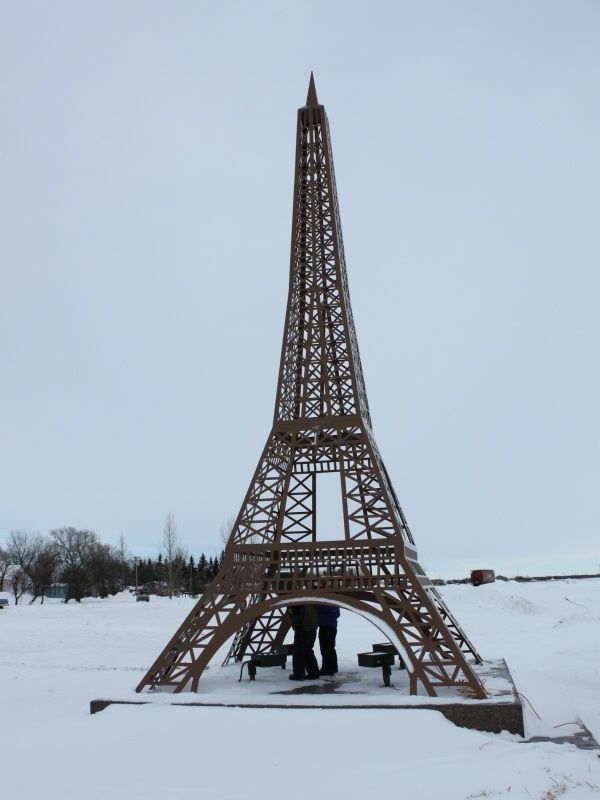 In Canada, in the town of Gasquet, is this strange stone structure paying tribute to the Eiffel Tower. She is in pebbles of river on a support of cement. 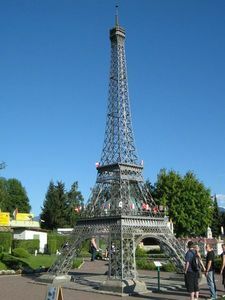 It is quite well done, it must be said, even if the resemblance to the real Eiffel Tower is very far, necessarily ... This sculpture is located along the Redwood Highway (Route No. 199) near the post office. We do not have the reasons for building such a building here. This small Eiffel Tower is in the city of Montmartre, Canada. 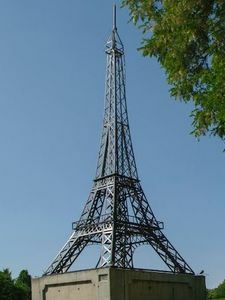 (Province of Saskatchewan) Like many cities named "Paris", "Montmartre" celebrates its French origins by building a copy of the Eiffel Tower. This one was set up by the French community of the city. It is at the northern entrance of the city, along Central Avenue. 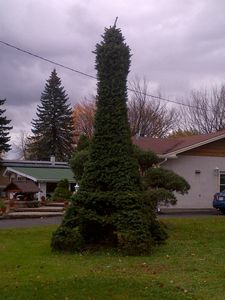 It is in the city of Terrebonne, Quebec (Canada), that you will see this copy of the Eiffel Tower relatively well done. It is on private land along Highway 640 and serves as a sign for a solarium construction company. With an approximate height of 20m, its first floor is even accessible, for authorized persons of course. 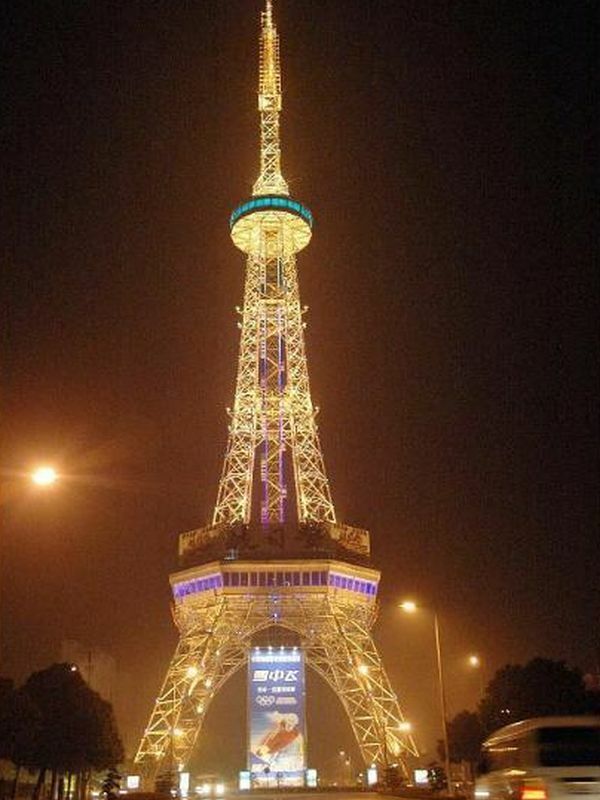 In Hangzhou, China is a Replica of the Eiffel Tower 108 meters high. It is in the center of a currently bushy area located in the city. The idea for the promoters was to make a sort of park of the main monuments of the world. He had planned Mount Rushmore, the White House, and so on. Only the Eiffel Tower was actually built in 2007, but the rest of the project is abandoned, leaving it alone, in the middle of nowhere. The Chinese hope that it will be quickly resumed. 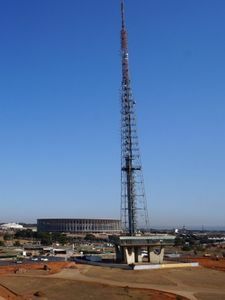 This tower is 108 meters high (354 feet) and is on the 1:3rd. It is made of steel for a weight of around 1,000 tons. Many couples come there, sometimes hundreds of kilometers, to get their picture taken in front of them, Paris being in their eyes the capital of romanticism. This Eiffel Tower is one of the rare presented here not yet realized during the writing of these lines, it is supposed to be in service in the 2nd quarter of 2016. 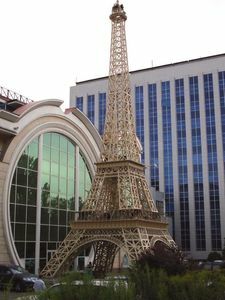 It is part of a complex named "The Parisian Macao" in Cotai Strip. As the style is French, this tower will serve as the figurehead of the complex. It is at a scale of 1: 2, 150m high. It will host a restaurant on the 3rd floor. If the project respects the computer image it will be perfect, but the actual realization will have to be checked to make sure that it corresponds to the project. A curiosity: The first floor of the tower will be connected to the shopping center by a covered tunnel, allowing visitors to go from the monument to the shops without going outside. China has several copies of the Eiffel Tower, it symbolizes for them the romanticism. 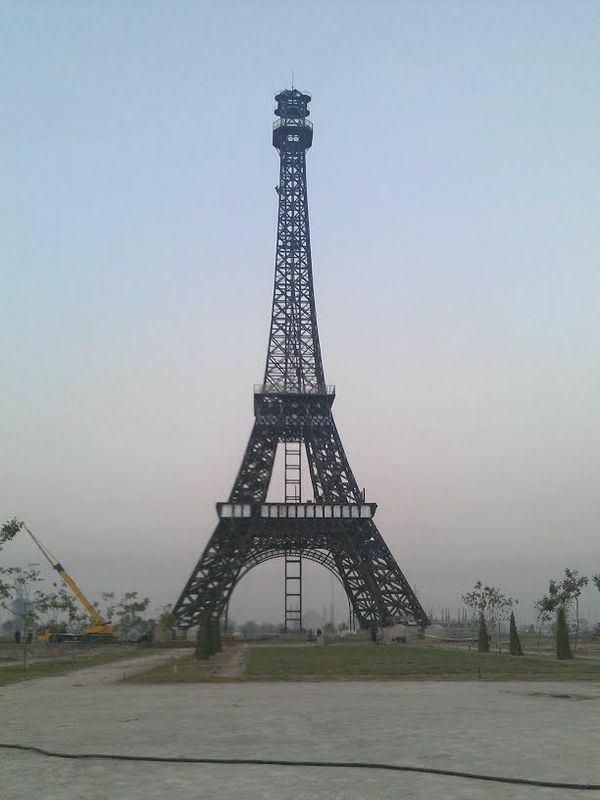 Shandong Province has placed one in public space, at the top of a few steps. It was meant to bring more tourists to the area. Aesthetically this tower is not badly made but nothing more. For example each floor marks a break in the curve of the tower, while the original tower is only a single curve. The first floor has a curious roof too, it does not exist on the real tower. When there is a little something that is disturbing to the pillars. This is probably because the decorative bow goes down to the ground while on the Parisian tower, it stops in contact with the pillars. 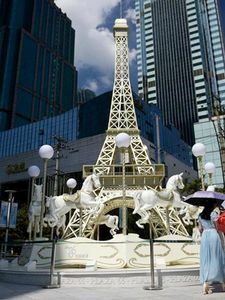 This Replica of the Eiffel Tower is very pretty, it is located in Shanghai, in the city center, in front of a shopping center. It has a purpose to be decorative, it adorns a carousel of wooden horses. 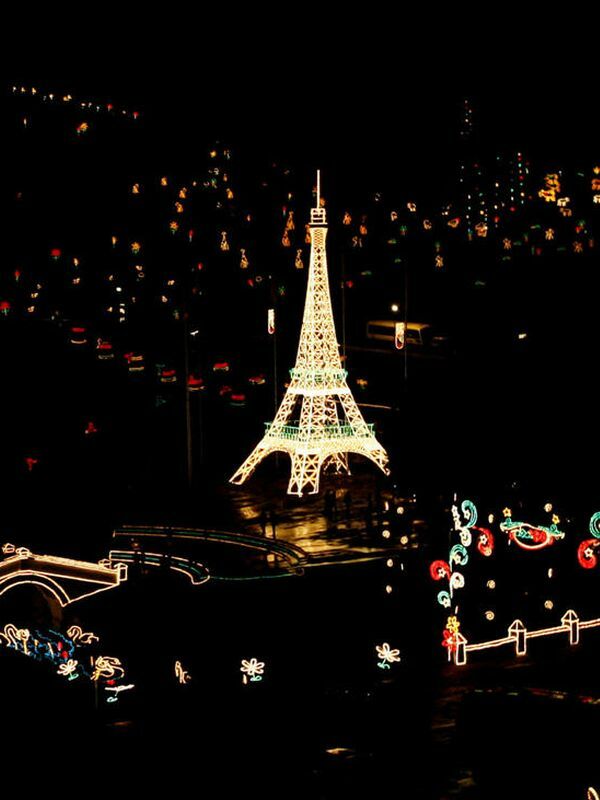 For the Chinese, Paris is a very romantic place, which explains why there are many references to this city in China. It is in Shenyang that this copy is 30m high. Its golden color is what is most original about it, because otherwise it must be recognized that it is rather successful, without major flaws. It is on a small black base that highlights the effects. 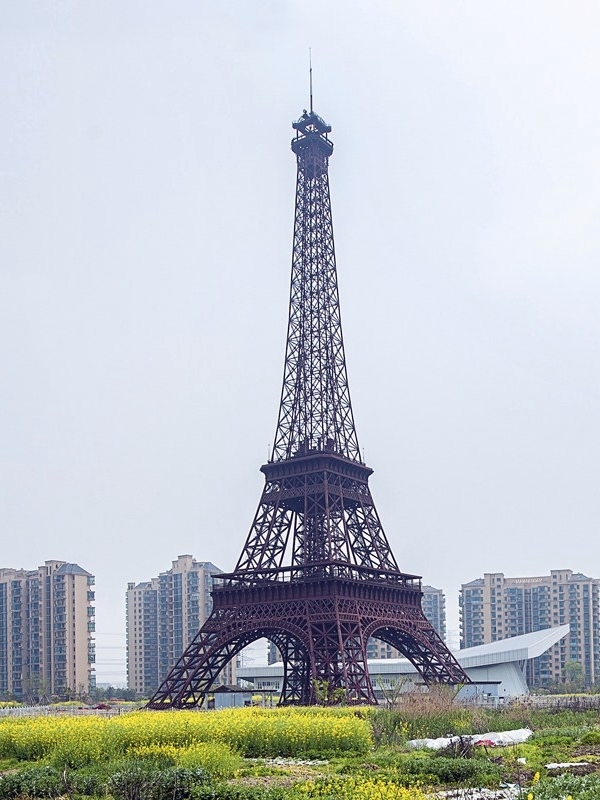 The city of Shenzen, China, has built in a park a beautiful Eiffel Tower perfectly reproduced. It must be said that it is in an amusement park reproducing the main monuments of the world, a park as there are several in the world. It's called "Window of the Word". This tower is very big, it is 100m high, a scale of 1: 3 th. This tower is very well reproduced, as said above. 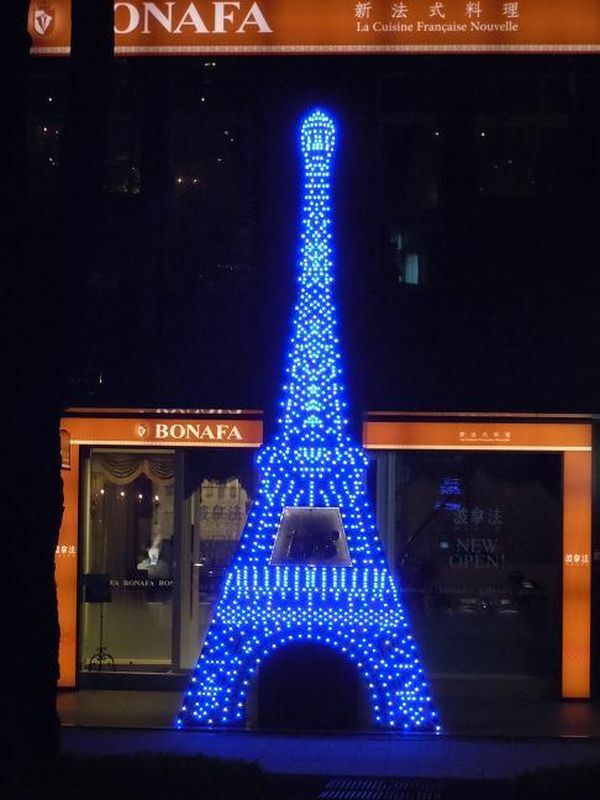 We do not detect, with the naked eye, of aesthetic problem compared to the real Eiffel tower. 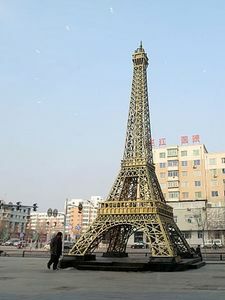 China has various copies of the Eiffel Tower, most of them very resembling. But it has only a vague resemblance to the original, it is the Dong Wu Tower in Suzhou. It has some similarities as the Parisian tower: It is a slender pyramid with a slight curvature, it has a fairly massive floor equivalent to the first floor of the Eiffel Tower, and a 2nd floor similar to the 3rd floor. It has telecommunication antennas, too. 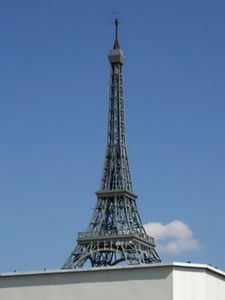 In addition, its general architecture is similar to the Eiffel Tower. On the other hand, it differs by the general plan, the 4 pillars are truncated and when they join the floor, it takes an octagonal shape. The third floor, too, is circular instead of square. Note that the lighting was made by a Frenchman. We are not in the presence of a real copy but rather of a tour of inspiration "eiffeic". 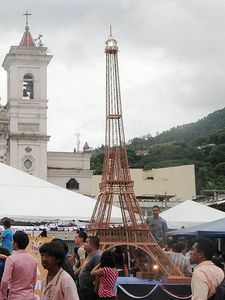 The city of Tunja, Colombia, hosted an ephemeral Eiffel Tower for the 2007 holiday season. It was erected in Puente de Bocaya and was fully illuminated. Its realization was simplistic but effective: The proportions were respected, and only two big mistakes were to be noticed on this copy: the 3rd floor, very different from the original tower, and the pillars which do not have internal structures. But since it was not intended to be a faithful replica, we accept this reproduction as a perfectly correct copy of her Parisian sister. The Eiffel Tower is sometimes intended to be only advertising ... 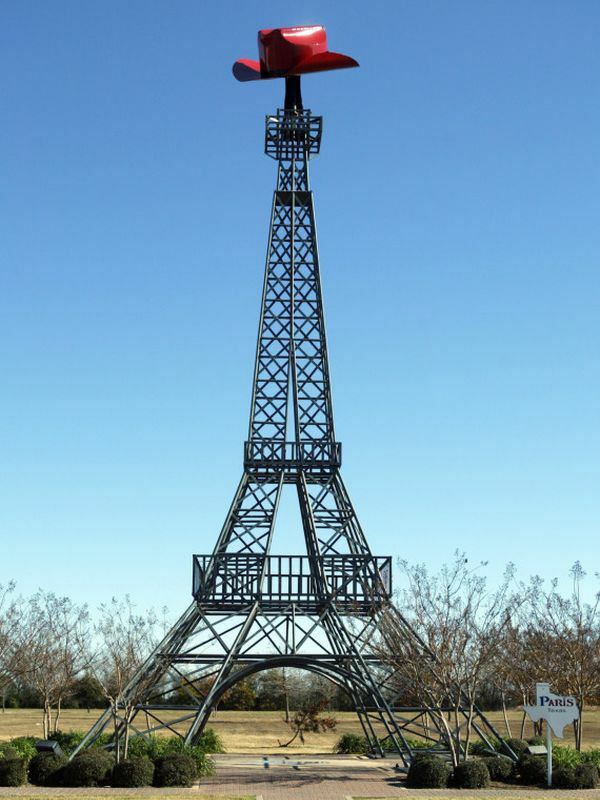 This single Eiffel Tower identified in South Korea was temporary, it has been disassembled for a long time. 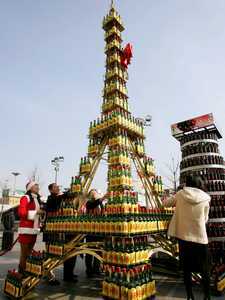 The idea was to reproduce the general shape of the tower with a metal structure in which was placed a large number of bottles of whiskey. This wooden tower is probably one of the farthest in this site. 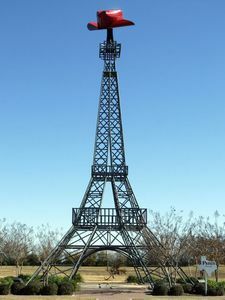 Its presence is due to the fact that it is often considered a copy of the Eiffel Tower, but the resemblance is very small. It is located in Copenhagen Zoo, the capital of Denmark. Its common attributes with the Eiffel Tower are its base, pyramidal shape, and the upper, vertical, reminiscent of the upper part of the tower. Both are cut by rectilinear floors with walkways. When at the top, the kind of Danish cupola reminiscent of the initial bell tower of the tower, that of the early twentieth century. But apart from that there is little resemblance between the two. 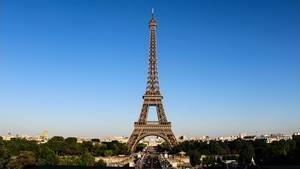 In 1890, a copy of the Eiffel Tower was inaugurated in Slagelse, Denmark. It was wooden and measured 140 meters high, an impressive monument. On its first platform, there were restaurants and at the top shone an electric light. This tower has been dismounted since, there is no trace of it nowadays. 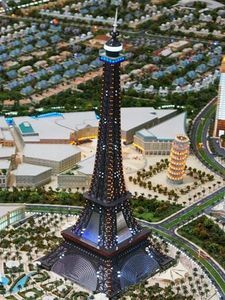 But this is still only a project, so we can not rely too much on this model, only representation of the future Eiffel Tower of which we know. 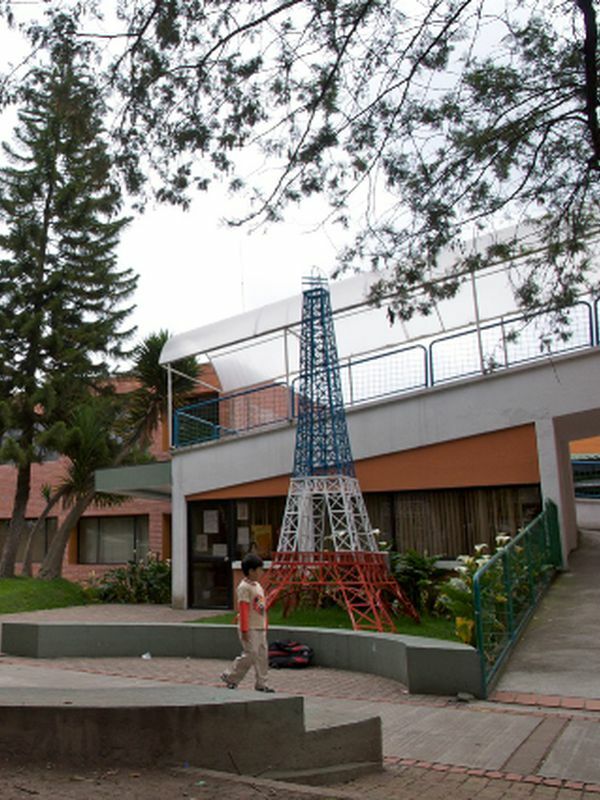 This small Eiffel Tower is located in front of the French school "La Condamine" in Quito, the capital of Ecuador. It symbolizes the country of attachment of the school. It's a pretty small copy, about 5m, that seems to be homemade. Its resemblance to the real tower is not obvious, it has very short feet, with decorative bows quite flat. Its curvature is not faithful either. Its originality comes from its color: Blue, white, red, it is very rare among the copies of the tower. 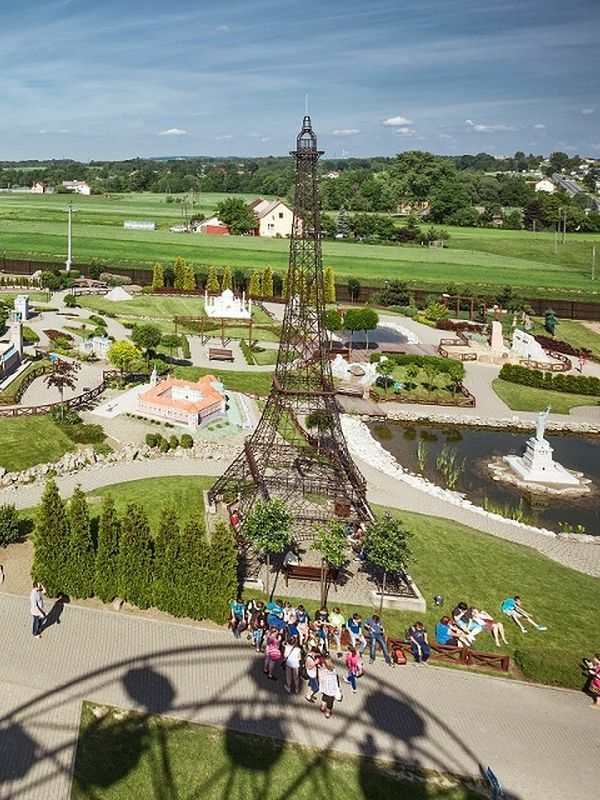 Park Europe is an amusement park featuring world miniature monuments, a well-known park style that exists in many countries. This one is in the city of Torrejon, Spain. The Eiffel Tower that is reproduced suffers from a great defect: Its 4 pillars meet between the 2nd and 3rd floor, very high, while on the original tower they meet on the 2nd floor. This small defect causes a very bad effect, this tower seems, suddenly, completely missed, it looks more like a pyramid on which we would have planted a pylon. And if you look closely, the rest of the construction is very well done: Color, bracing, floor layout, everything is correct. 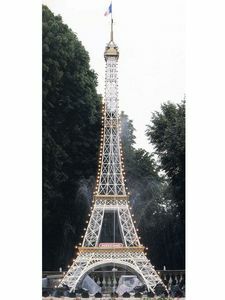 The floors, they are more symbolized than actually reproduced, and it is probably a factor aggravating the beauty of this copy of the Eiffel Tower. It still measures more than 30m high, so it is at the scale 1:10th. This is probably the Eiffel Tower the worst of all this document that is there. It is located in Estonia, on the island of Hiiumaa, and belongs to an individual, Jaan Alliksoo, an original who has assembled on his land a lot of bric-a-brac recalling the house of the postman horse, in France. This one seems to be made of rattan, it is much more flared than the real tower and its summit and very little conform. There is an Estonian flag at the top. In Florida there are a lot of amusement parks, Florida is a resort destination. Disney settled there and opened, in addition to its magic kingdom and its studios, a park named EPCOT Center. It is a succession of 12 hamlets arranged around a lake. Each hamlet is country-themed. 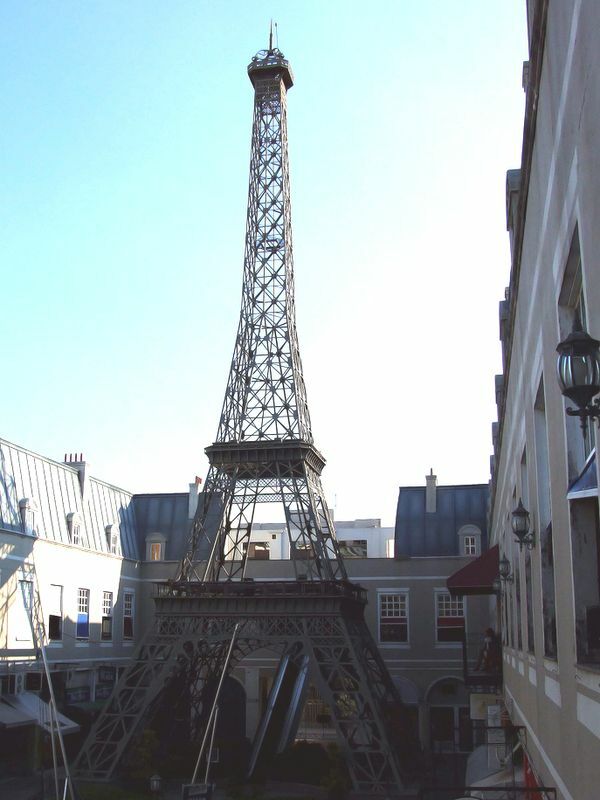 That of France has a theater, various shops, and so that the decor is complete, a miniature Eiffel Tower. Well, it's still 23m high, for a ratio of 1:14 th. It's pretty well done, its proportions are good and the curve that the pillars take is correct. She does not visit. 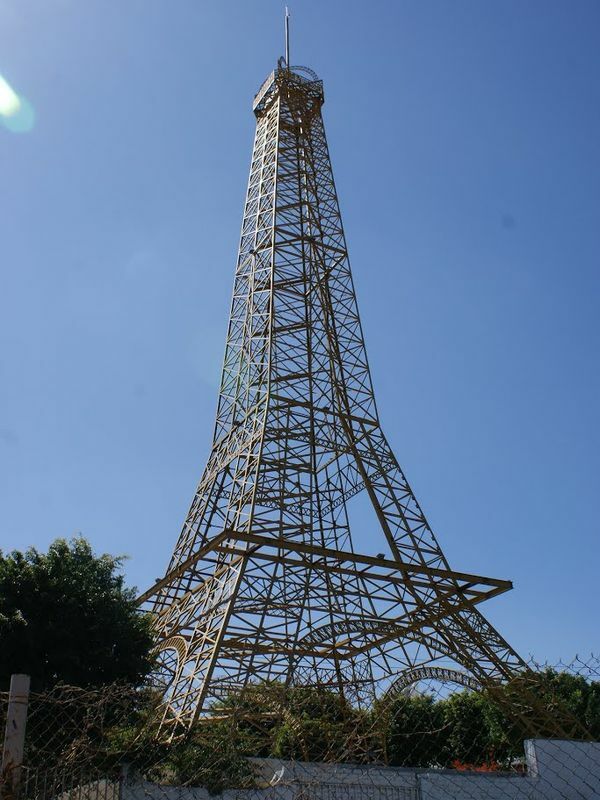 This is a Replica of the Eiffel Tower in Meccano, the famous building game that generations of children have used. She was assembled at the Technology Museum of Georgia in Atlanta, Georgia, USA, during the year 1990-1991. Alas in 2004 this museum closed and the tower was dismantled and abandoned. It was 11m50 high for a weight of 420Kg, which is rather light for such a size, knowing that the Meccano is metal. It required 15,672 pieces, 29,880 bolts and 826 hours of work. Its shape is quite correct, if not a corner too pronounced at the first floor, the actual tower is a little more curved. On the other hand, the floors are well reproduced and the pylon rising to the top is perfect. Note also the excellence of the 3rd floor, a generally sloppy floor but here is very well reproduced. 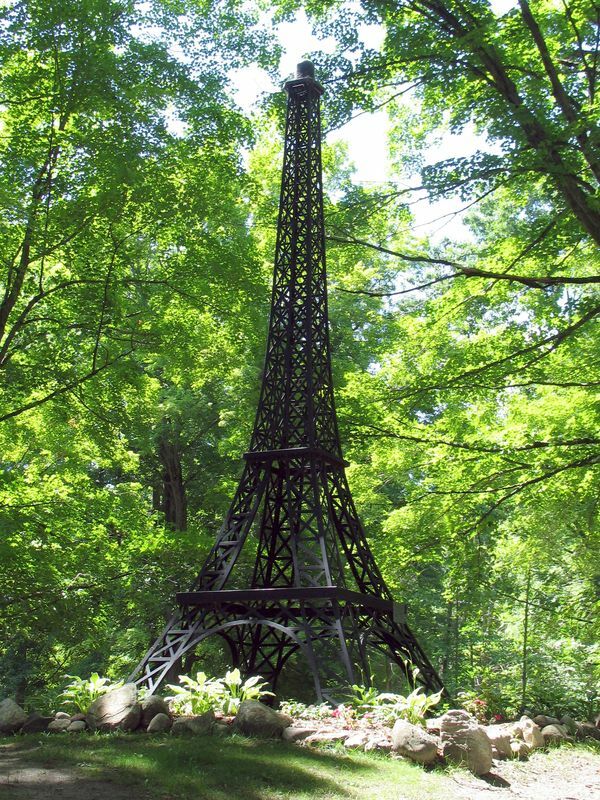 This little Eiffel Tower is only a few meters high. It is in Ihoa, USA, on a sidewalk in the city of Boise. His reason of being ? The presence of the "Café de Paris" in the city center. 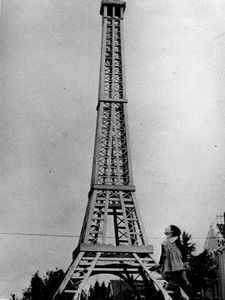 Honestly it does not have a great resemblance with the Parisian tower, one feels that its author did the best but without being able to reproduce exactly the floors since it is only a big bent and worked mesh of so as to make him marry the shapes of the Eiffel Tower. It's quite successful, but it does not give a real copy. The 2nd floor was materialized but not the first, which is rather curious. 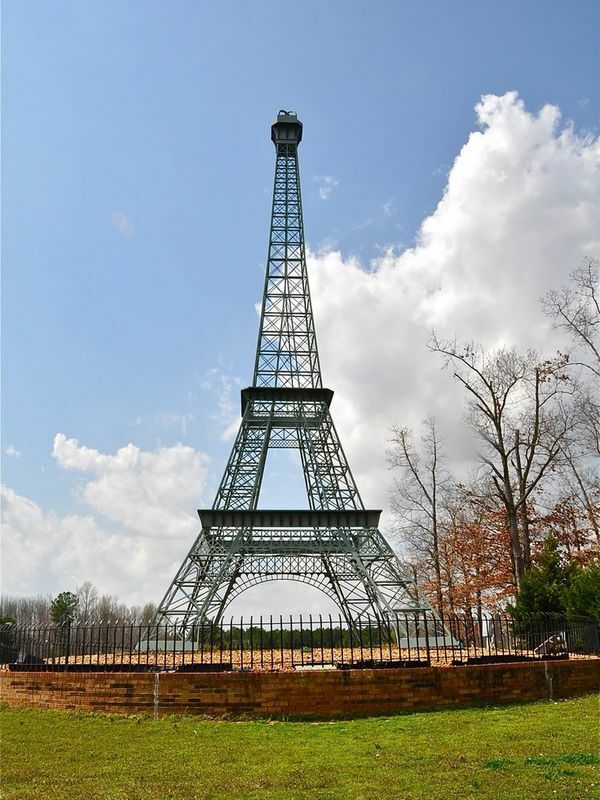 This Eiffel Tower is located in the city of Paris, Michigan (United States). It was built in 1980 by students from the "Mecosta-Osceola Career Center" of Big Rapids, they used slats of metal beds. It is 6.1m high (20 feet), for a scale of 1:55 th. She is currently in a city park, in the shade of trees as shown in this picture. From the point of view realization at first glance shows that it is very successful, but as soon as we look closer we see that its floors are just marked, that the 3rd is almost nonexistent, and that the top is a little strange anyway ... 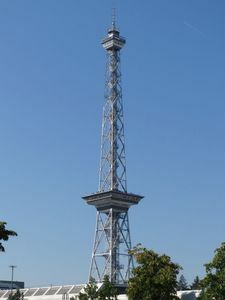 The fact of having used recovery material does not make perfect, but we must recognize that the work is still good, and as the general aspect is ok, this tower is very nice to watch. Note the accuracy of the curves and the presence of decorations on the first floor. 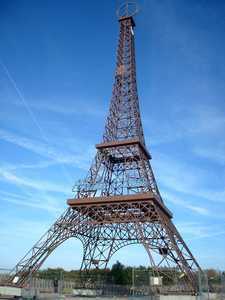 The United States owns several copies of the Eiffel Tower on their territory. One of them is well known, she is in Fayetteville, Northern California. 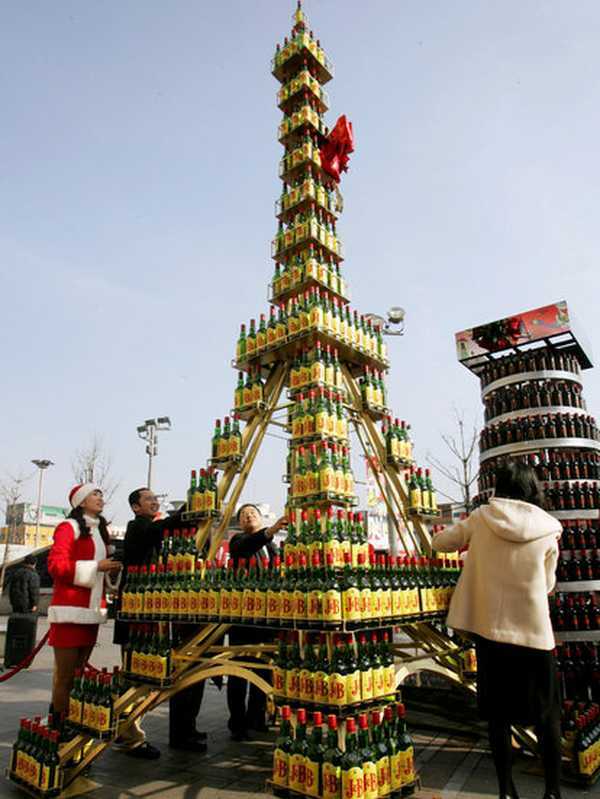 There, it is called the Bordeaux tower. It is 45m high and its design is simple, but effective. 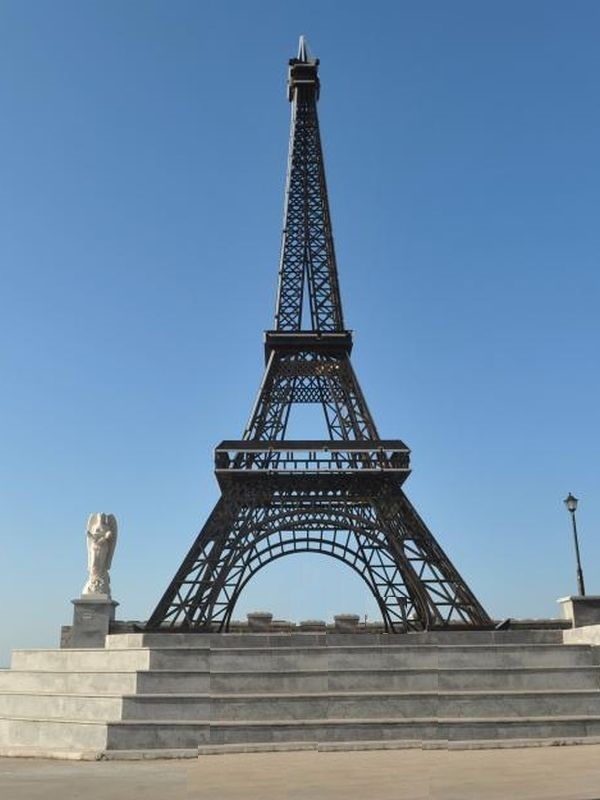 It is immediately identified as a copy of the Eiffel Tower thanks to its general shape and its succession of "caissons" (openwork blocks superimposed on each other, this is what makes the Parisian tower), but otherwise it is not a perfect copy. The floors are not very marked, without floor (which is classic on the copies), and the 3rd floor is a free inspiration, with a reminder of the original campanile. But otherwise the decorations are well reproduced. It was painted white for a reason that I do not know. 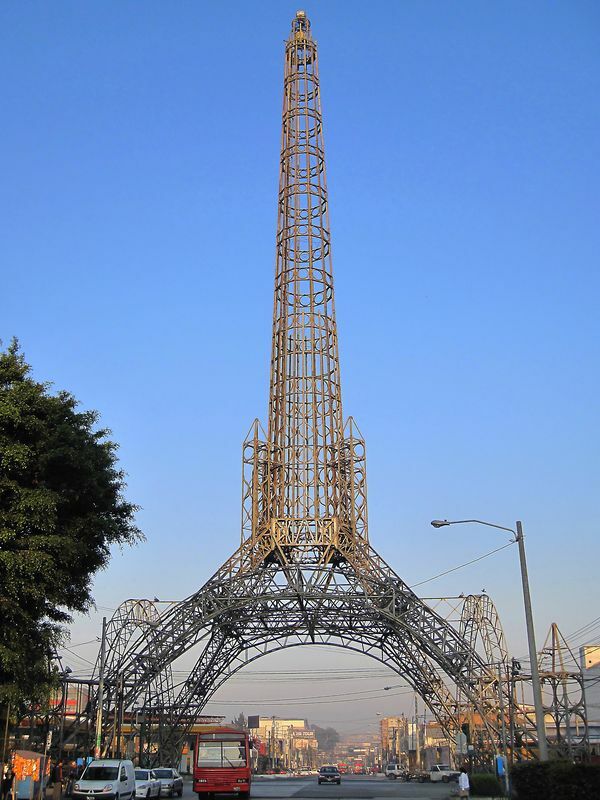 This copy of the American Eiffel Tower is little known and yet it is of a very high quality. Its proportions are well respected, the floors well reproduced and even the third floor, however rarely succeeded, and quite correct. It is located in the town of Raleigh, in a shopping area near various bars, restaurants (including a French crèperie) and various shops. If, in the photo, it seems 'stung' is that it was surrounded, at the time of shooting, many garlands that make it glitter at night. 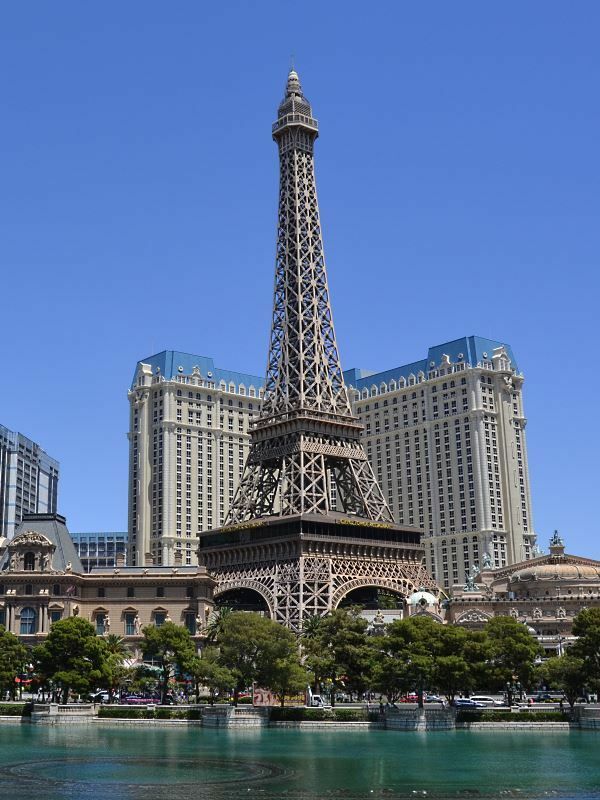 The Eiffel Tower of Las Vegas is undoubtedly the most famous replica of the Parisian monument. 165m high, made on a scale 1/2, it is located along the Las Vegas Trip (This great avenue that crosses the city and along which are all the famous casinos). 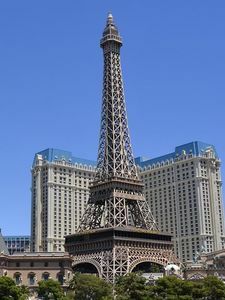 More exactly, it serves as a backdrop for the casino "Paris Las Vegas", a casino managed by the "Caesars Entertainment Corporation". 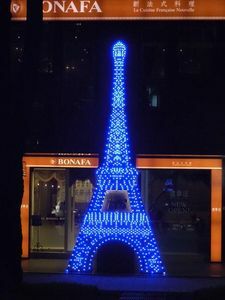 As its name suggests, its theme is France and especially Paris. It contains, besides this tower, a copy of a balloon, a triumphal arch, La Fontaine des Mers, etc. Knowing the Americans, this copy can only be perfect. And yet this is not the case, there are differences between it and the original. The most striking is the roof covering the first floor gallery, a roof that does not exist in Paris. The other fault is the third floor, whose gallery is not quite high enough. After, there are the antennas that are missing, but for that we can not speak of imperfections. 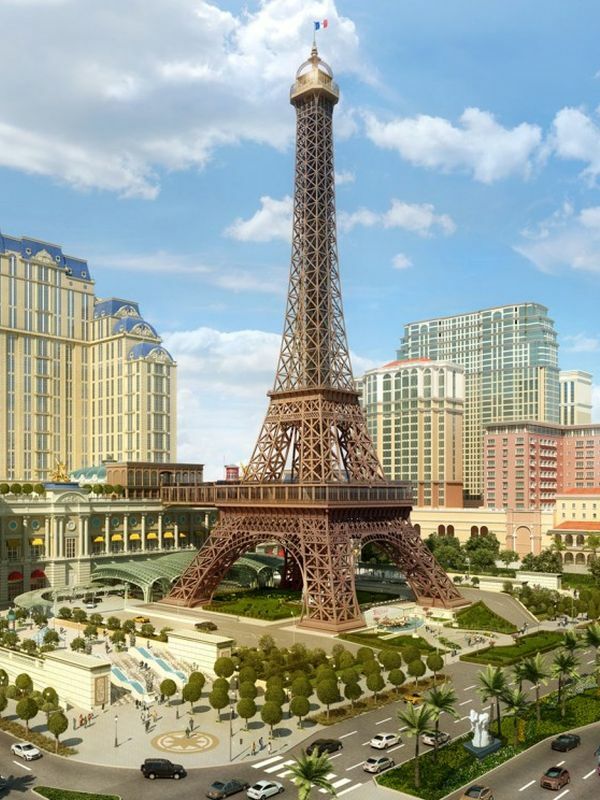 As you might expect, the Las Vegas Eiffel Tower is one of the best reproduced in the world. 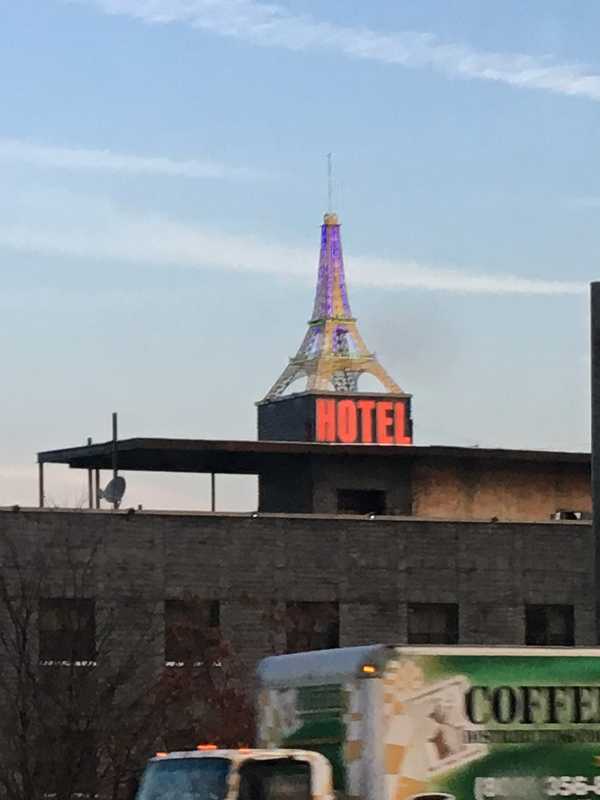 This Eiffel Tower is advertising, it is on the roof of a hotel, in the Bronx, between JFK airport and Manhattan. It is rather small and its shape is correct, but to say more it would be necessary to see it closely. 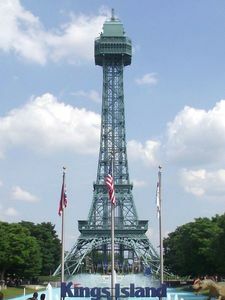 This copy of the Eiffel Tower is at Kings Island amusement park located in Ohio, United States. It is approximately 100 meters (scale 1: 3 th). It was manufactured in 1972 to be placed in the park's central aisle, near the entrance. There are 15,000 rooms and the staircase is 410 steps. She has a sister, made 3 years later, who is at Dominion Park, Virginia. 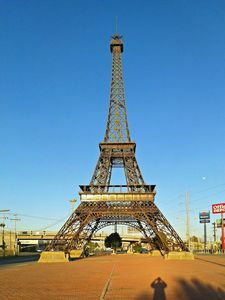 The Eiffel Tower in Paris, Tennessee, was the subject of a battle with the namesake city of Texas. It is nearly 20 meters (60 feet), which makes it 1:20 th. It is installed in a square of the city. Unlike Texas, which is just a kind of ordinary metal structure, it's a real working copy. It reproduces perfectly the curvatures of the original tower, and the floors are well marked, if not complete. We would have liked, for example, that the floors are there. Note the top floor is fairly well reproduced while usually it is he who is the worst done. It must be said that it is the hardest to reproduce too. There are two Eiffel towers in Texas. This one is in Austin, the capital of the state. 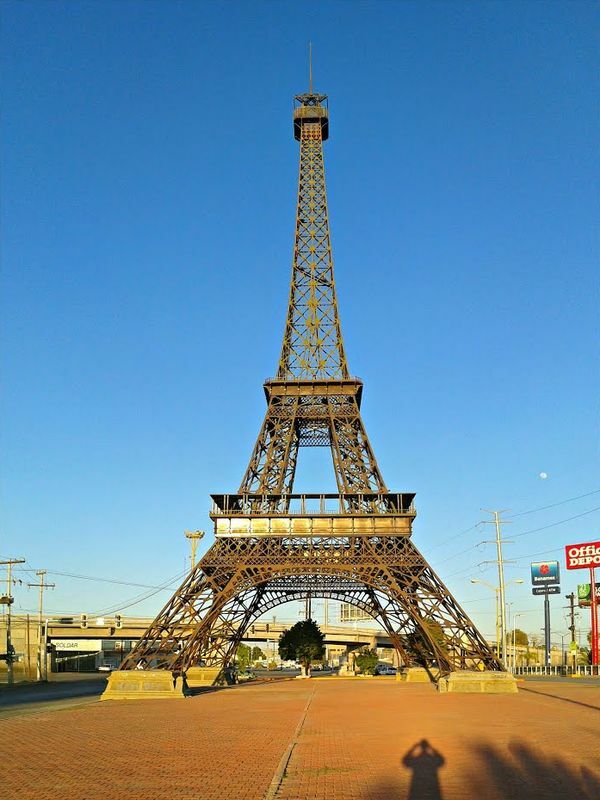 It is called the "Dreyfus Eiffel Tower" simply because it is facing the antique store Dreyfus, 1901 North, on Lamar boulevard. It is 7.5m high, which makes it to 1:25 th. This tower is original in its color, red. 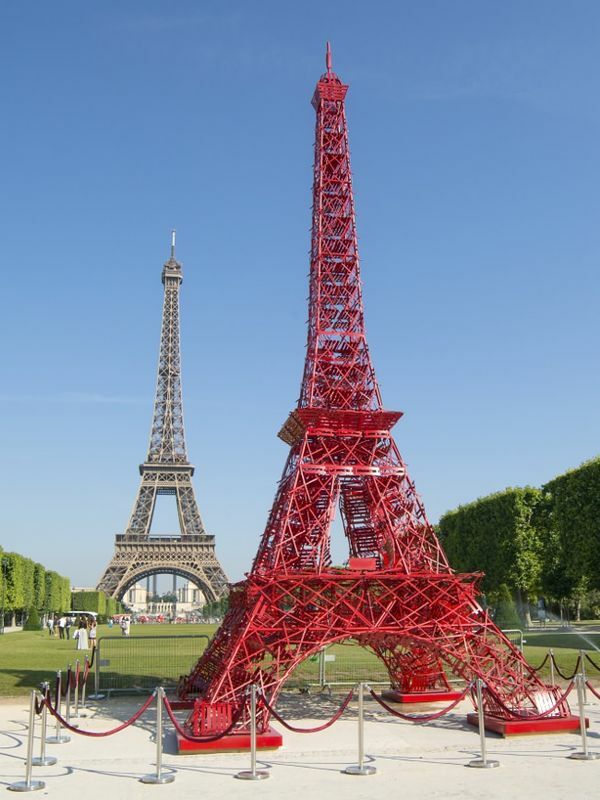 Not so surprising that when we know that the Eiffel Tower was red, a time soon after its construction (See Painting the Eiffel Tower) It is well done, the copy is close to compliance. It has a campanile as had the Parisian monument in the early nineteenth century. His floors are incomplete, especially the second one, which has none of the two levels. It should still note the quality of the spacers, as well as the "grid" located under the first floor. 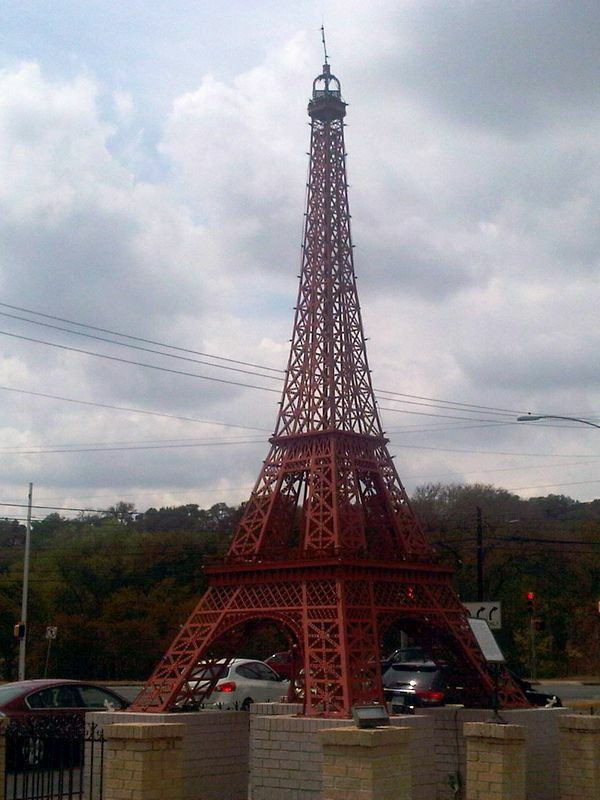 Well, comparing them, there is no picture: Where the inhabitants of Tennessee have a real reproduction of the Eiffel Tower, Texans have only a vague structure more like a pylon than true copy. Some will say that it is the intention that counts, but when we see the quality of the copy of Tennessee, we regret the bad taste of this reply. 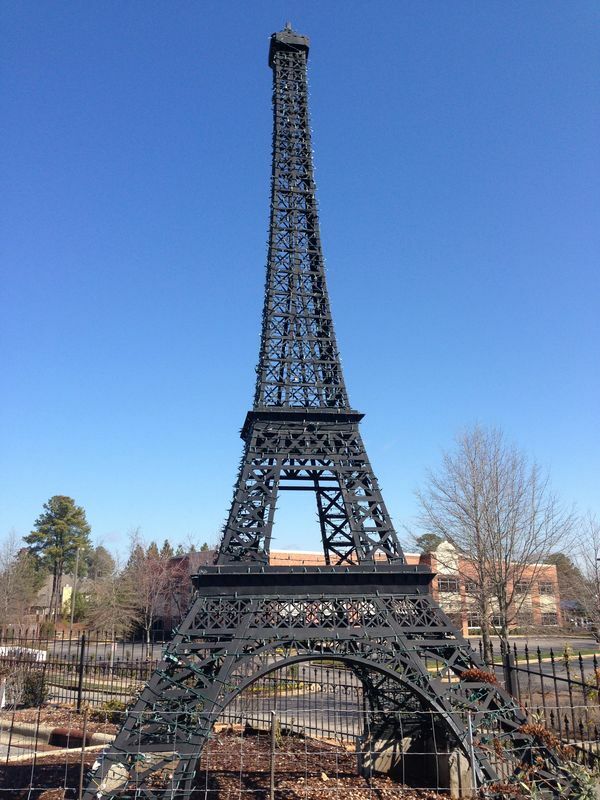 This Replica of the Eiffel Tower is presented as a statue, it is rare enough to emphasize it. It is approximately 1m50 high and its base should be 1m20, roughly. This donation is a tribute to Françoise Bernhard, founder of the French Circle and the Alliance française in Salt Lake City. This sculpture was made by R. Prazen on sketches by Annette Johnson. She is in the French garden. It is pretty well reproduced, the resemblance is good. It looks a little too slender, and of course, on a Replica of this size, it is impossible to do too much detail, so the floors and antennas are schematized, but it's not bad at all. 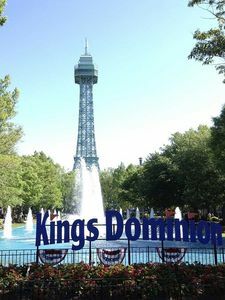 Kings Dominion Attraction Park is located in Virginia, United States. It is 101 meters high, which makes it scale 1: 3 th. It was built in 1975 by the Bristol Steel company three years before that of Kings Island, his sister. It serves as the central point of the park, in the international part, just under the fountains of the main entrance. It was manufactured from 450 tons of steel and is equipped with elevators installed by Haushahn Elevator of Austria recently. 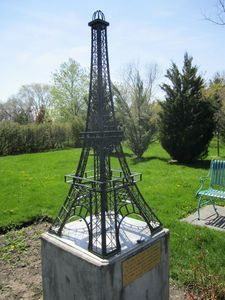 This copy of the Eiffel Tower is one of the rare to be presented as a statue, it is on a solid base, concrete rather simple. It is located in the village of Apach, France, on the border with Germany and Luxembourg. In the village she is at the entrance. There are letter-cut bushes that write the word "Apach" right next to it. We do not know why this tower was built. Aesthetically it is a rather successful tower. As she is small, there is little chance that there is all the details, which is the case, but we can not blame the manufacturer. On the other hand, the curvature of the tower is very well respected, and it is something rare on the replicas, especially on the replicas of big sizes. 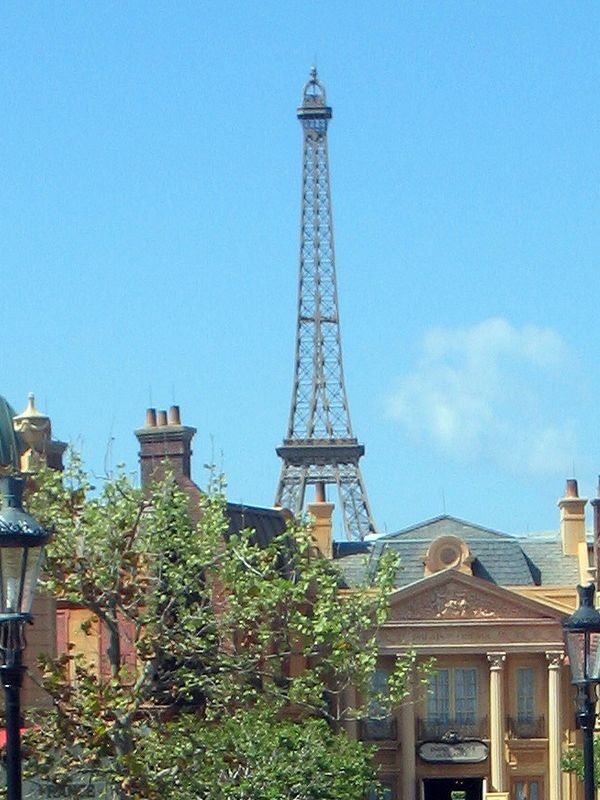 A small flaw, however, the 4 pillars join the level of the 2nd floor on the real Eiffel Tower while here they join at mid-height between the 2nd and 3rd floor. This Replica of the Eiffel Tower no longer exists ... In fact it only existed 2 days, during the "Festi'Briques" which takes place in Auxerre. The "Festi'Briques" is an exhibition specialized in Lego. On 2000m 2 of surface to Auxerrexpo the enthusiasts came to show their know-how by mounting the famous bricks to do many things. This Eiffel Tower is over 5m high and required 150,000 bricks. "This is a world record height for a model of Eiffel tower in Lego non-glued," said Frédéric Veuillotte, secretary of the association and owner of the tower. "It has no frame and is completely removable". To mount the structure, Frédérique Veuillotte and David Constant, who took care of this model, used a scaffolding to join the upper and lower parts of the Eiffel Tower. The work done by these two people lives up to their passion. Borrowing a great realism, this copy is almost perfect. The curvature is not strong enough, but apart from that everything else is done correctly. The braces, especially, are very realistic, as the third floor, always difficult to imitate. This copy was ephemeral, it was built on June 24, 2014 by a furniture chain that highlighted the quality of its furniture during this day. 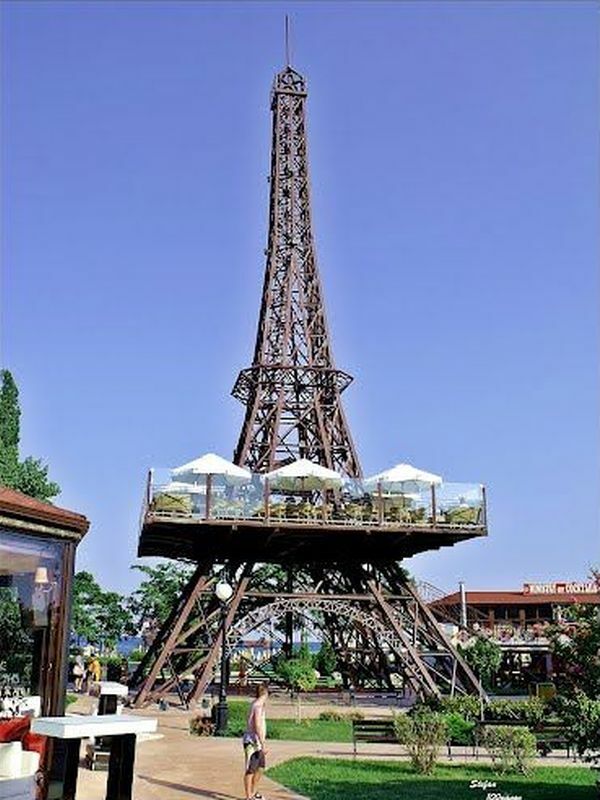 Indeed, this Eiffel Tower consists only of bistro chairs! It seems incredible, but yet it is the case, it took quite a lot to reach this tower more than 10m high. Only the 2nd floor, 3rd floor and the campanile and its antenna are not in bistro chairs. This is a real tour de force, a very original ephemeral work. 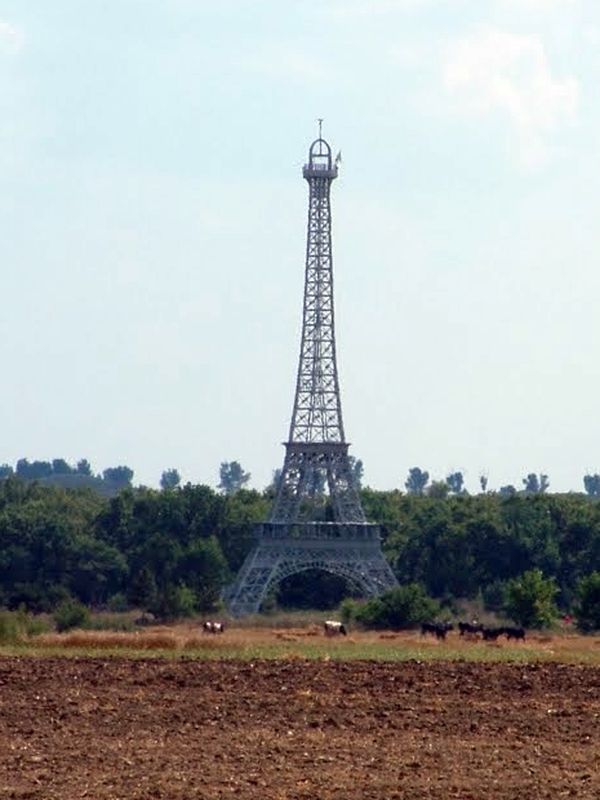 Beautiful copy of the Eiffel Tower than that of Buissières-les-Belmont, France. It is a Replica of large size, about 30m high, whose general appearance is very well reproduced. What he shocks the most, looking closer, is the lack of height of the third floor. The 2nd floor is just marked, it is not really built. But this copy is still very well done. 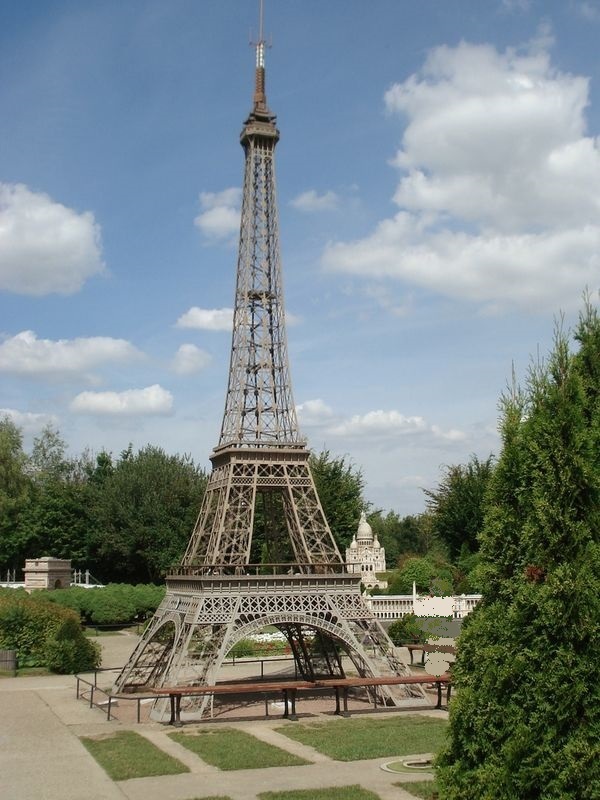 In the Paris region, in Elancourt, there is an amusement park based on the main monuments of France which are reproduced on a reduced scale. 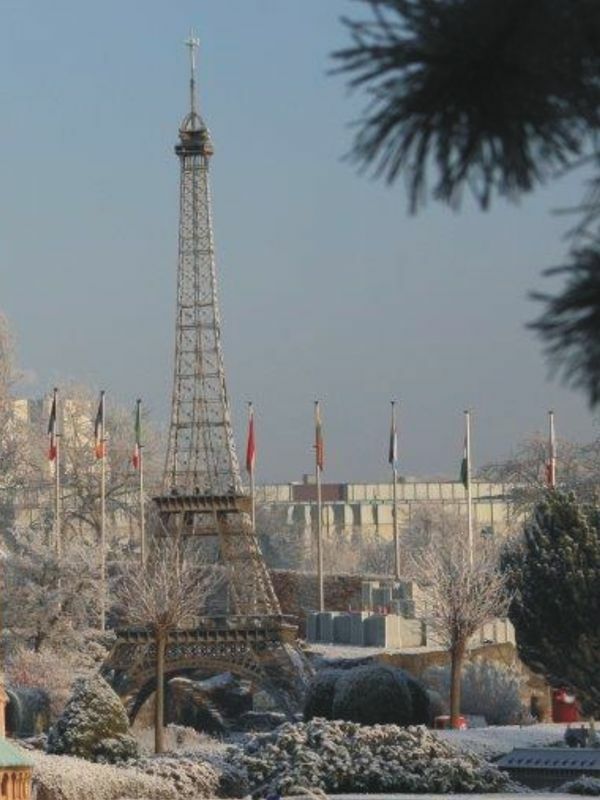 Very nice park, it contains of course a copy of the Eiffel Tower. It measures 10m high and weighs 3.2 tonnes. Its exterior appearance is close to perfection, but to look closely we see that the four pillars have no beams on the inside, while the real Eiffel Tower has. This architectural detail aside, the rest of the tower is perfectly reproduced, especially the 3 floors that are always the hardest to do. 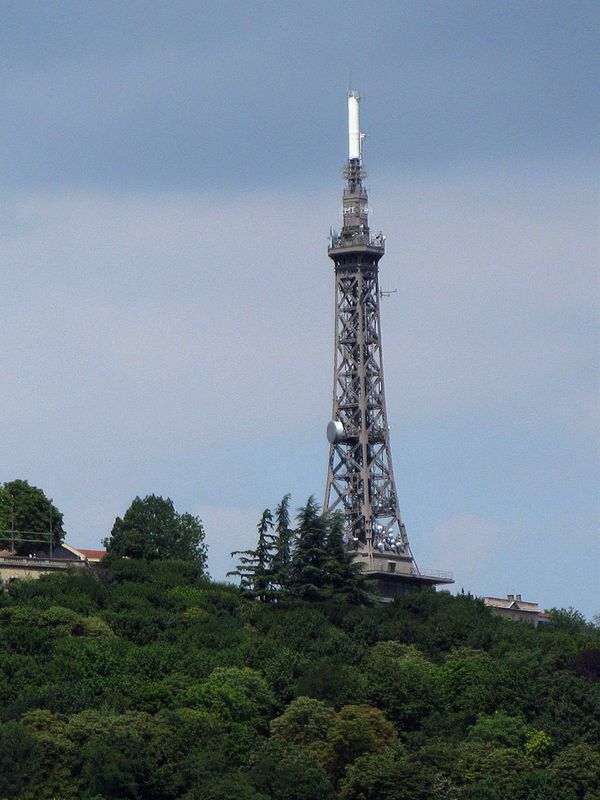 In France there are several copies of the Eiffel Tower, but it is probably that of Fourvière, Lyon, which is the best reproduced. 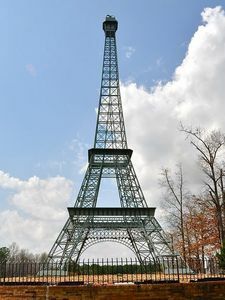 And for good reason, because it was built in 1892, very shortly after the Eiffel Tower. It has therefore benefited from the same construction techniques as the original. It is 85.9m high, about a quarter of the normal height. This tower is really similar to Paris, it has the same characteristics. 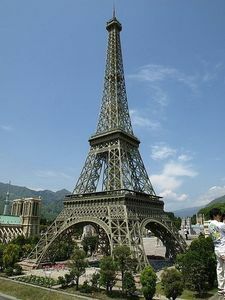 It has only one floor, so it looks like the upper part of Eiffel. It serves as a telecommunication antenna, that's why it has a white elevation. 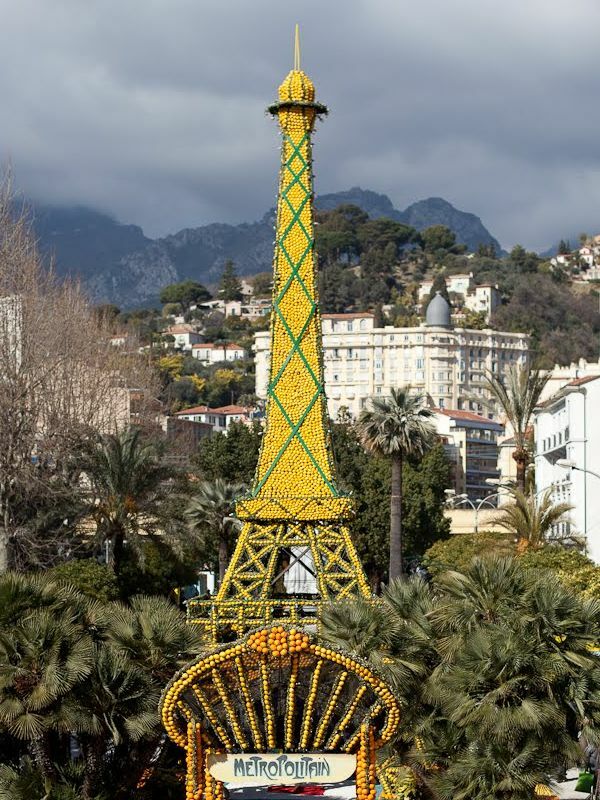 Sacred bet that to reproduce the Eiffel Tower in lemons ... A curious idea of the city of Menton, specialized in the production of this citrus fruit, which, to celebrate its flagship product during the annual festival, built this tower in 2012. Aside from the metal structure and lighting, all the filling is made of lemons and orange, for some specific parts. Note the agglomeration of lemons on the top of the tower, it's impressive! It is a small mise en abyme that takes place here, since this copy - stylized - of the Eiffel Tower is on the first floor of the Eiffel Tower! This is a small structure, probably in ice, which was mounted next to the lapatinary, the winter where such an ice rink was installed at this curious place. Well, she does not want to hear a faithful copy, of course. 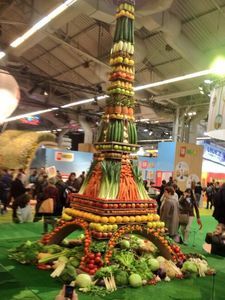 This vegetable tower was set up in St Jean d'Illac in 2014 for an agricultural event. It is made thanks to a metal structure with floor ... and a good amount of various vegetables! 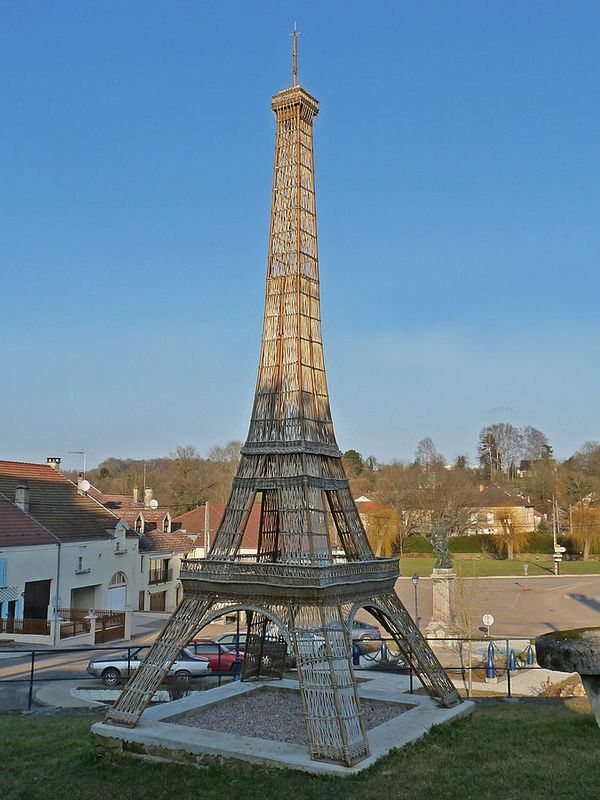 The palm of originality goes to the Eiffel Tower of St Hilaire, a small village in the Meuse. 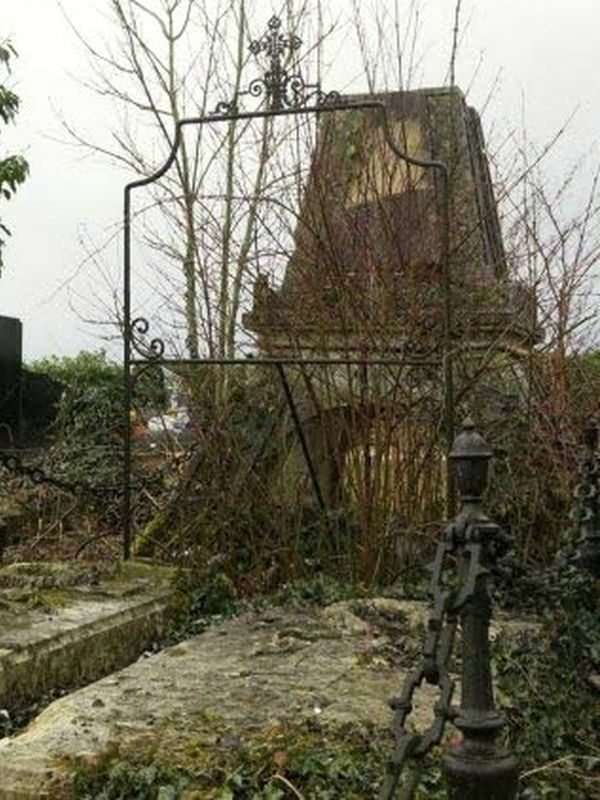 This village houses since September 1890 a copy of the Eiffel Tower ... in his cemetery! Mr Darbois, one of the owners of the village, had a seven-meter-high Eiffel Tower erected on his father's and mother's grave and surmounted by a cross. On the first floor is a statue of St. Joseph, and a marble plaque, placed between the feet of the Tower, lists the names of the deceased. 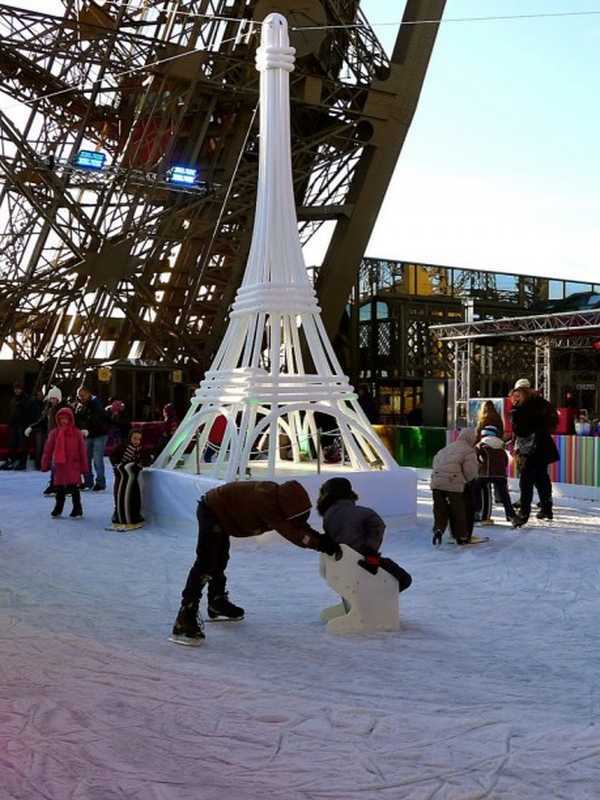 This idea of resting his parents in the shadow of the Eiffel Tower has raised the reprobation of some, the admiration of others. Nowadays the tower has been partially destroyed, but it still remains the entire lower part of the building. 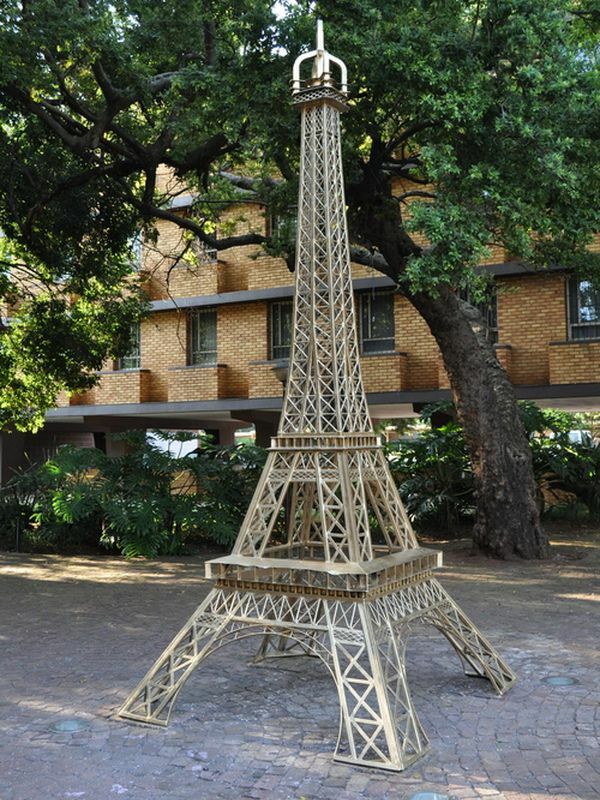 Very strange, this Eiffel Tower was ephemeral, it was disassembled now. It was 31m high, one-tenth the size of the original for 12 tonnes. When we observe it we are struck by the quality of reproduction. Admittedly, it is far from perfect but when you know that it is a craft, a particular, Mr. Maindron, we say that it is still well done. It is a very original construction, but which had no particular objective behind. This Eiffel Tower is in Soing, France. 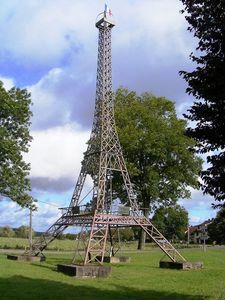 This is a construction done by volunteers in 1992 to symbolize France at the Eurosaône festival on July 12 this year, a party that took place in Seveux. Twenty years later she was still there for a first restoration. Completely dismantled then repainted, it has been rebuilt identically. It is very well done, it must be said, although its 4 pillars are a little too fragile (or at least they seem to be). But we must salute these volunteers who did a very nice job, to see on the spot. 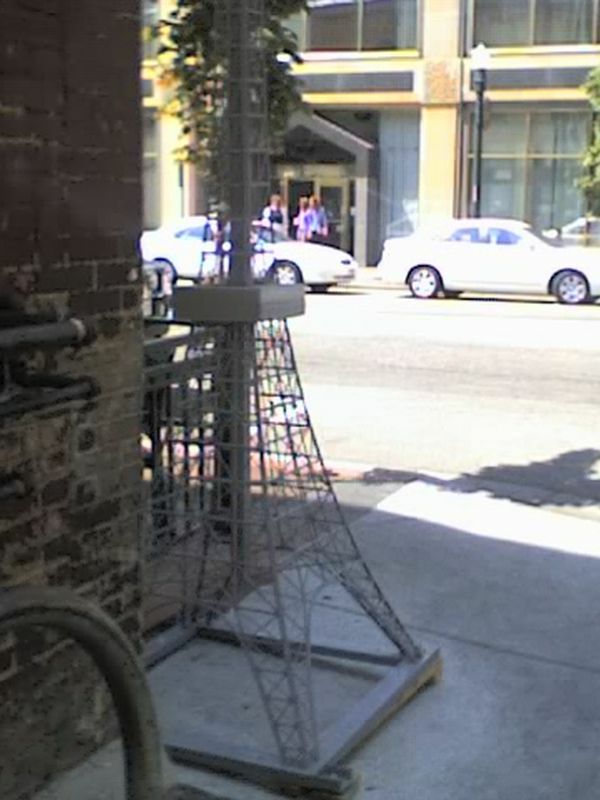 For information, this tower is at 1:20 th. It weighs 2 and a half tons for 16m height. Here is one of the few Eiffel Tower that was built of wood. Unfortunately it has since disappeared, it was built in the 50s to commemorate the Liberation of the city in September 1945. It was built near the Power Station, rue de la République. Its author is Henri Ueberschlag, an EDF agent. 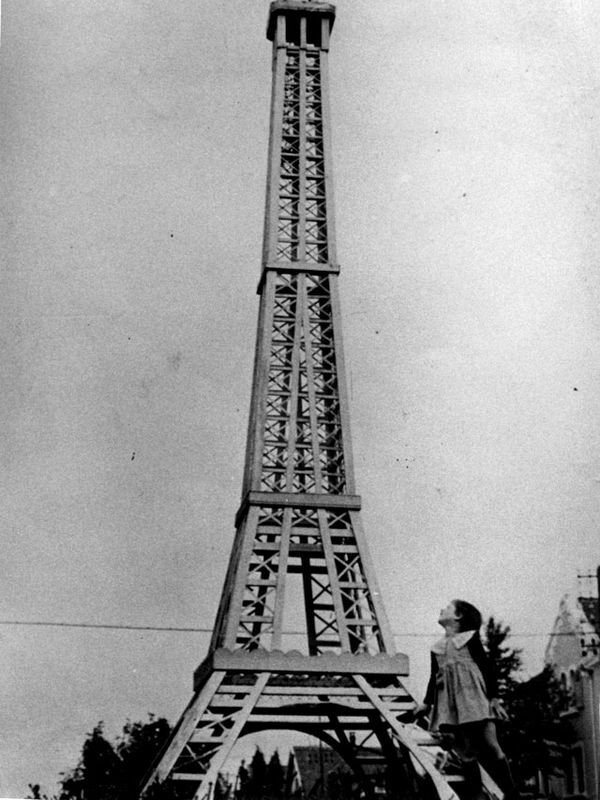 This tower was 6m high, at a scale of 1:50, and required 364 pieces of wood of all sizes and 232 braces to give it stability. She was the highlight of the show organized that day. It is clear that for assembly of wood, it was very well done. The village of Filiatra, near Messinia, is known for its copy of the Eiffel Tower. It's in the Peloponnese, Greece. The tower is at the entrance. It is 18m high, making it a 1:20 replica. It was built in the 60's and since then it has been enthroned at its location. Aesthetically, one might think at first glance that it is quite consistent with the original, but something is wrong anyway. 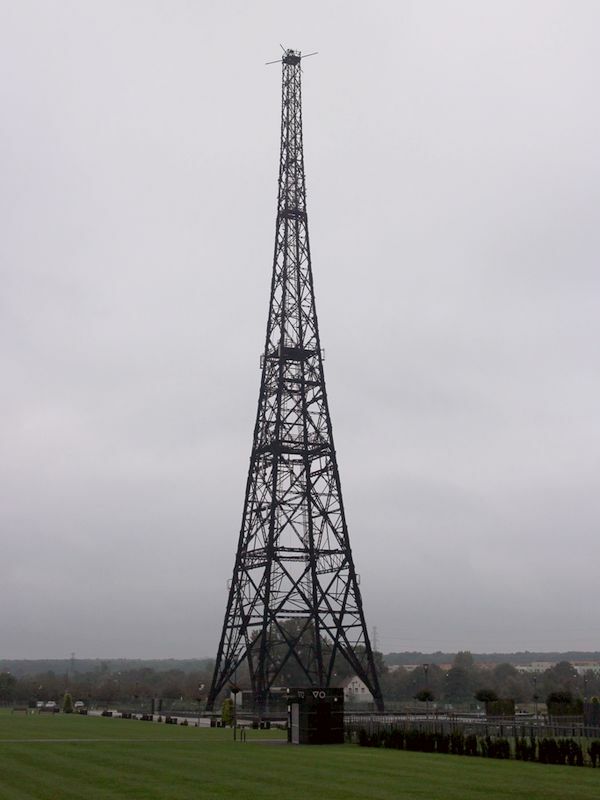 In fact, there are a few things that are wrong, the most important probably being that it looks more like a pylon than a Replica of the Eiffel Tower, it's due to both its light gray metal and to its shape, a little too long. This extension is reinforced by the fact that the 2nd floor is quite low, on the original tower it is higher, which breaks the height. The third floor, then, is very simplistic. It is made of a metal disk while the real tower offers a cube. Finally the first 2 floors are rather strange, as if it was a kind of balcony. If at first you feel like you're dealing with a rather successful copy, this replica is actually quite different from the original, but because of a series of details. 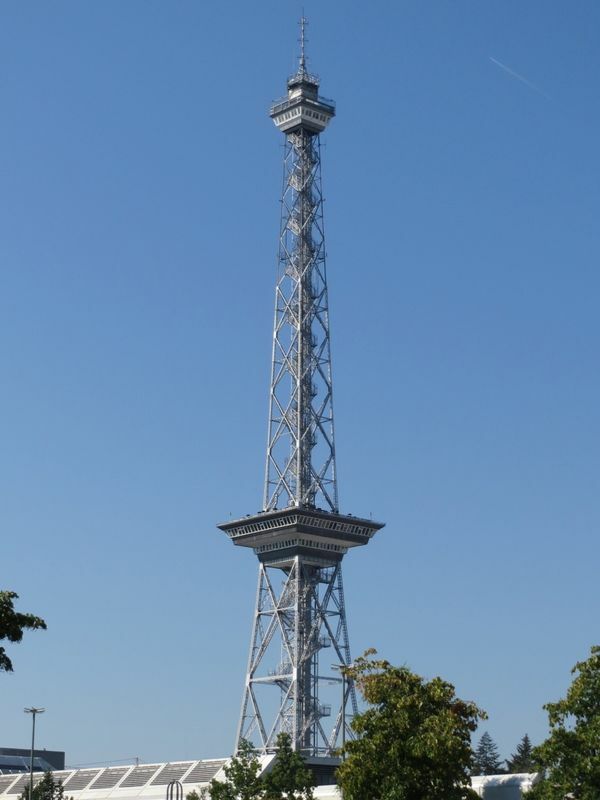 Otherwise, note that this tower is still 75m high (1/5th of the Eiffel Tower), and it was erected in 1935. 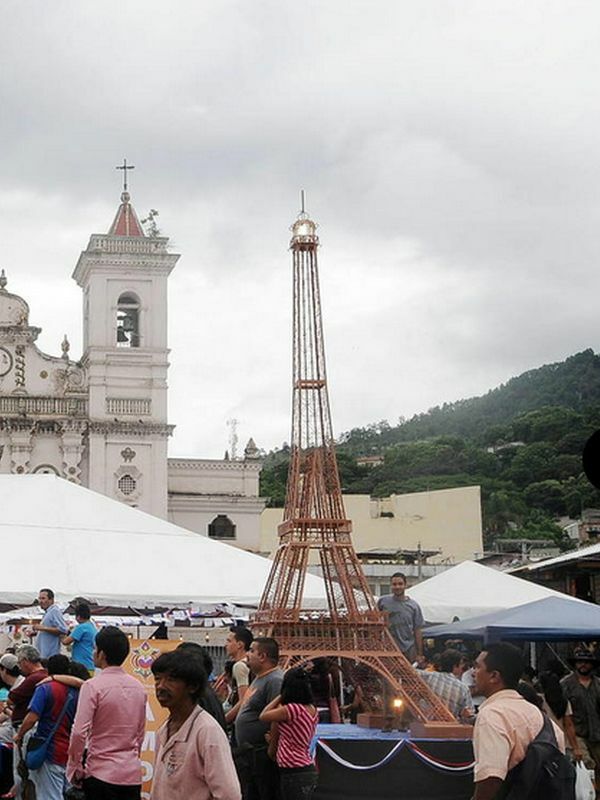 Honduras has a copy of the modest-sized Eiffel Tower in Tegucilgapa, its capital. She is in Los Dolores Square. 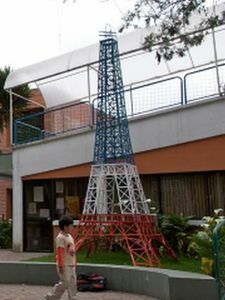 It was offered by France (via its embassy) in Honduras to celebrate the 221 years of the French Revolution. It is six meters high and is installed on a black pedestal facing the cathedral. For such a small tower, it is fairly well reproduced, especially the lower part, always more complex to do. 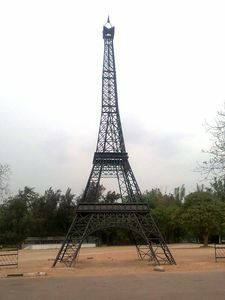 This Eiffel Tower is one of the main attractions of Nicco Park, an amusement park in the Salt Lake district of Calcutta. This district is also called Kolkata. The Eiffel Tower serves as an observation tower so that visitors have a wide view of the park, what to do, to see, it gives them a panoramic view. This replica is 30m high for 30 tons of steel. It took 3 months to build it. It should be noted that this is not a true copy, although it is approaching: The shape of the tower is not respected, the 2nd floor is just maeterialized while it is where the 4 pillars meet. Here, they meet above. There is no internal lattice either, this tower is made of only 4 faces, while the original has 4 complete pillars. 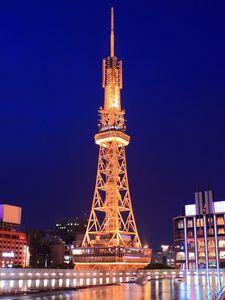 But it is still a beautiful tower whose golden color is beautiful. 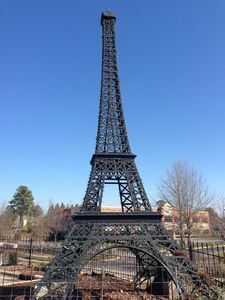 This Replica of the Eiffel Tower was built in 2010. It is not particularly high, approximately 12m, and its design leaves something to be desired. It does not have a correct curvature (a little too filiform) and its two floors are just marked by decorated plates. It is located in Changigarh City, India, and we have no explanation as to why it was built. 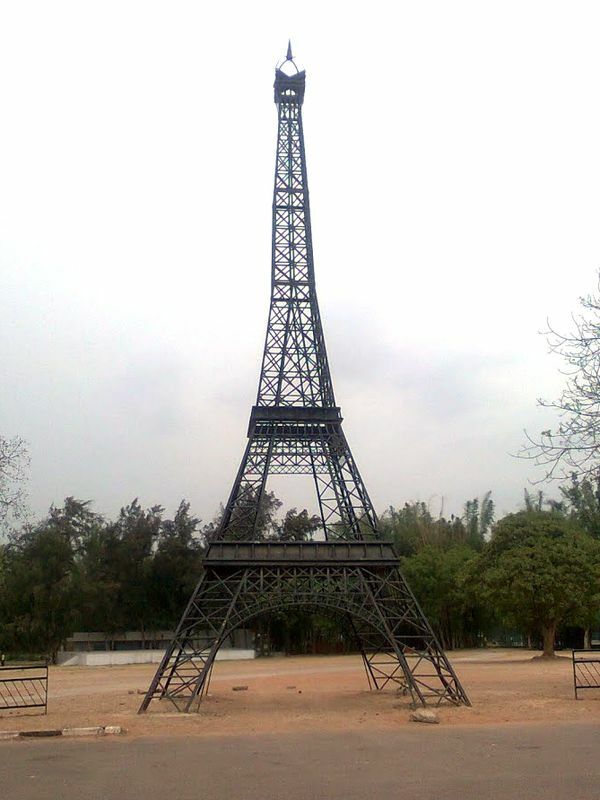 This small Eiffel Tower is in the city of Kota, Rajasthan. 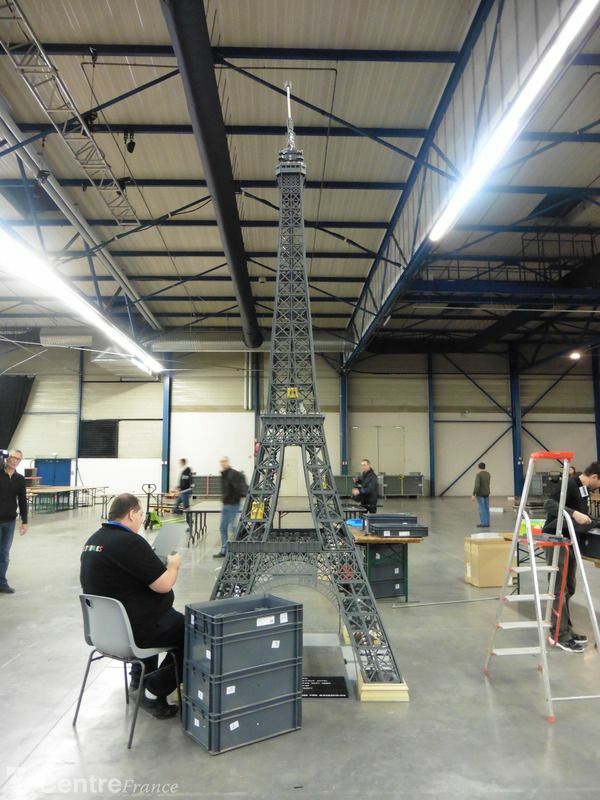 It is still 12 meters high but can not be classified in the big rounds, since its scale is 1:25e. We do not know the reason for its construction, especially since it does not seem to be especially in the spotlight. It is pretty well reproduced, but it is a reproduction that is not perfect, it still has a lot of defect. Its 2nd floor, for example, is a simple metal plate that goes around the pylon. 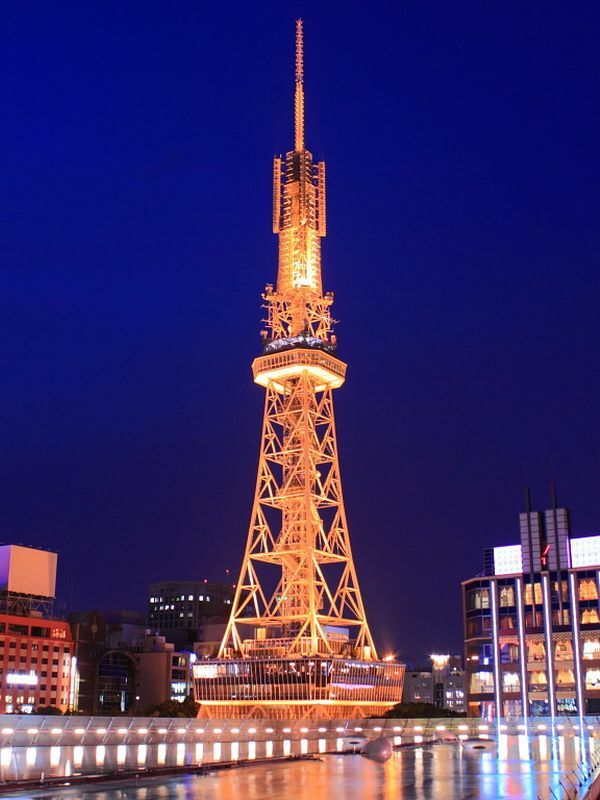 The Nagoya Tower is a 180m telecommunication tower located in Japan, Nagoya of course. 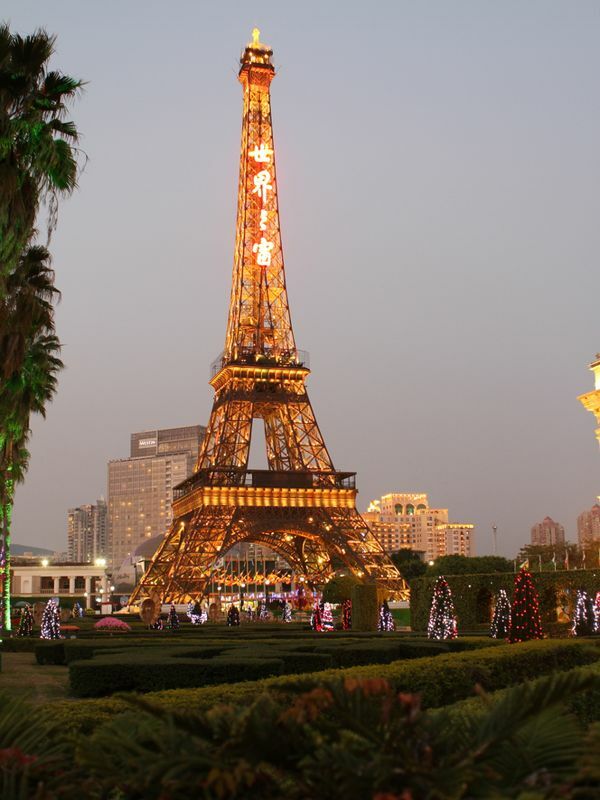 It has a metallic structure vaguely resembling Eiffel Tower, and as it has an observatory, it is often compared to the Parisian tower. But it's not a replica in the sense that we usually hear it. 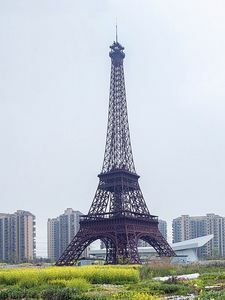 This tower is quadrangular, it is made in the form of caissons, like the Eiffel Tower, but it has a central pillar absent on its Parisian sister. It has only one floor consisting of two levels, both being galleries of observation of the city. The summit looks a bit like the top of the Eiffel Tower, with its many antennas. Tobu World Square is an amusement park reproducing the monuments of the world on a reduced scale. Walking in the alleys is very nice, we see 42 monuments very well reproduced. This park is located in Tochigi Prefecture, Japan. The Eiffel Tower is presented next to Notre Dame, two elements of the heritage of Paris. The reproduction of the Eiffel Tower is 12m high only, which is not very big but remains proportional to other works. The quality of the copy is exemplary, everything is perfectly reproduced, beams at the curvature of the tower, decorations of floors to the antennas of the summit. We are here in the presence of a true copy, one of the few on this list. 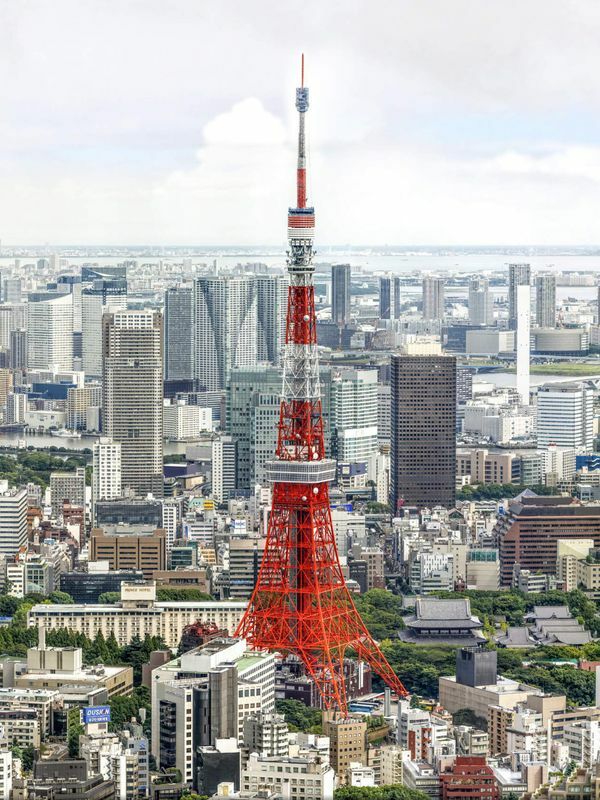 The Tokyo Tower is probably the finest example of a copy of the Eiffel Tower that does not want to be one. 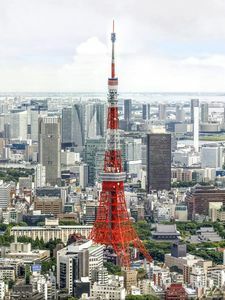 It is a telecommunication tower watering all the agglomeration of Tokyo. 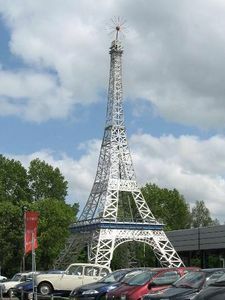 She is well known and is part of the list of replicas of the Eiffel Tower, while it is not a real copy. But it must be said that she looks a lot like him. 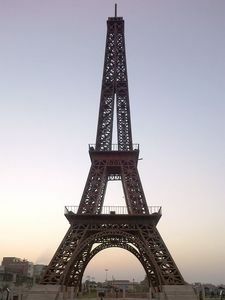 Already by its size, because measuring 332.5m, it is higher than the Parisian tower. Then by its shape, square base, slender towards the sky, and having two floors. Only two where the Parisian tower has three, but it must be said that enough, here. 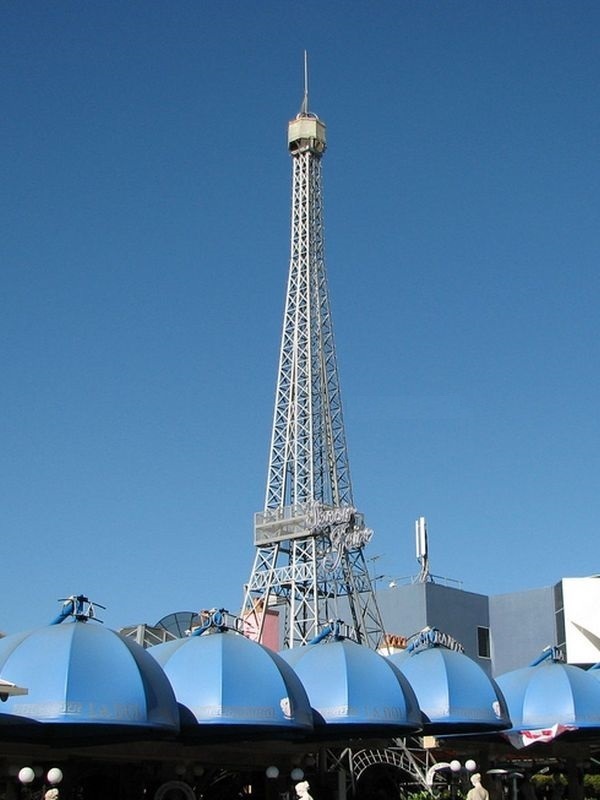 The architecture of this Japanese tower is really similar to the Eiffel Tower: 4 square feet that join with decorative arches, and an impressive spire. 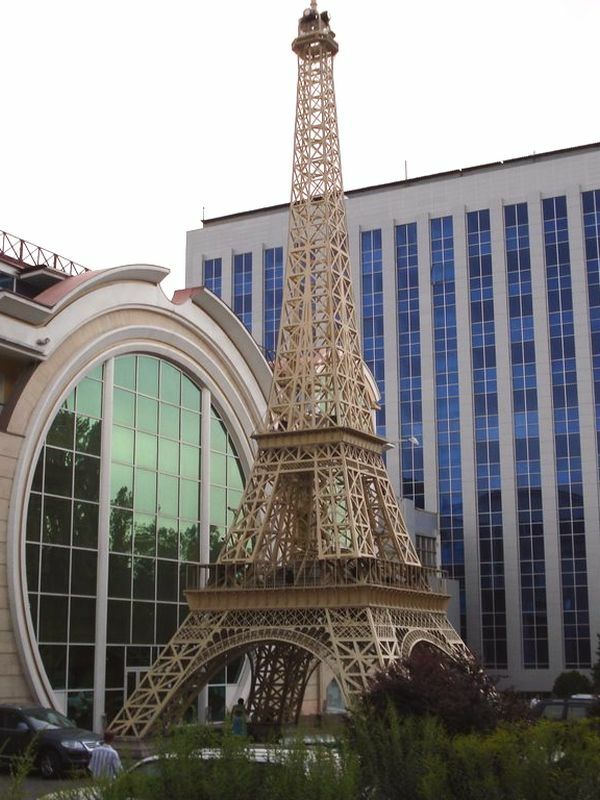 Very beautiful Eiffel Tower than that of Almaty, the capital of Kazakhstan. 20 meters high, she stands in front of a French goods store on Furmanov Street, the Parisian House of Fashion. It is pretty well done at what you can see at first. Even the floors are rather successful. But there are two things that are problematic. The first is the shape of the beams, too regular, and the second is structural: The first floor is only 4 boxes instead of 5, and the roof of the first floor is proportionally too low. Similarly the 3rd floor is quite poorly done. But apart from these minor defects, it must be said that the general appearance is nice. 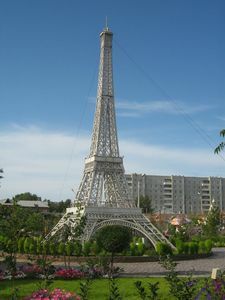 Kyrgyzstan's capital is Bishkek, and this is where you can see this small Eiffel Tower 3 meters high. She is in front of the French consulate, hence the presence of the tricolor flag. This tower is not very well done, but as usual, it's the intent that counts. The proportions are not too poorly respected, with the exception of the third floor whose pillars are not yet together and the summit strangely shaped ball. Good reproduction, on the other hand, of the first floor and its decorative arches. Well, then, we are in the most complete delirium: Why is this telecommunication tower, located in Riga, the capital of Latvia, in this list? Just because she is on the list of copies of the Eiffel Tower that can be found everywhere, so she joins her here too. But it is the furthest form of the original tower that can be found. It only shares the fact that it is a telecommunication mast, a slender, pyramidal shape, and an observation platform allowing visitors to see the surroundings from high. But that's where the comparisons stop, because all the rest is only differences: Material used, number of pillars, solid structure here while the Eiffel tower is perforated, etc. 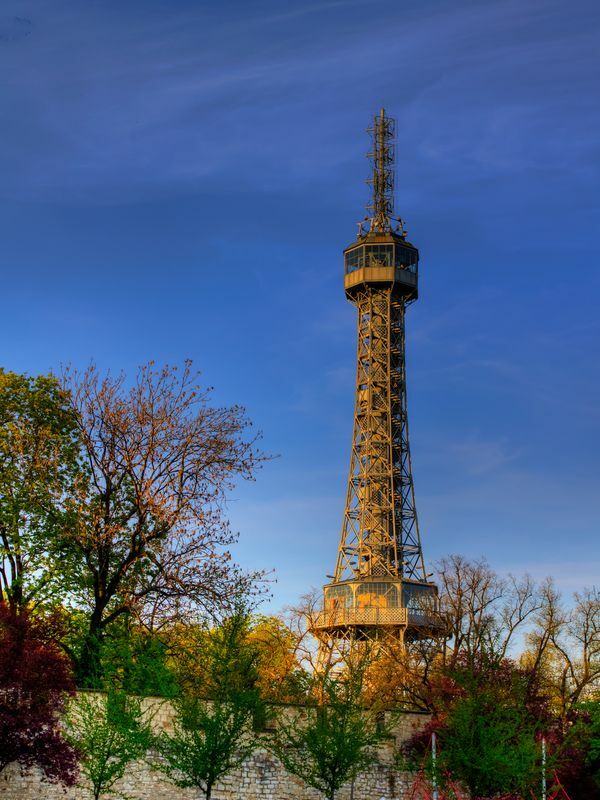 Note that this tower measures 369 meters and is the highest circulation tower in the European Union. 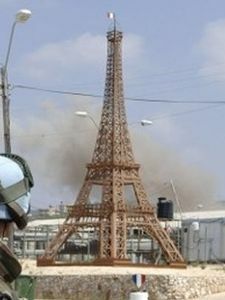 This Replica of the Eiffel Tower is in Lebanon, near the Israeli border. It was installed during the war, in July 2006. It symbolizes the European intervention in this region of the World. Rather well done, she respected the proportions and the real trick. Only its floors did not conform to the model: Too thin, barely marked. The top of the tower was also not very well done, but apart from that, everything was very well reproduced. 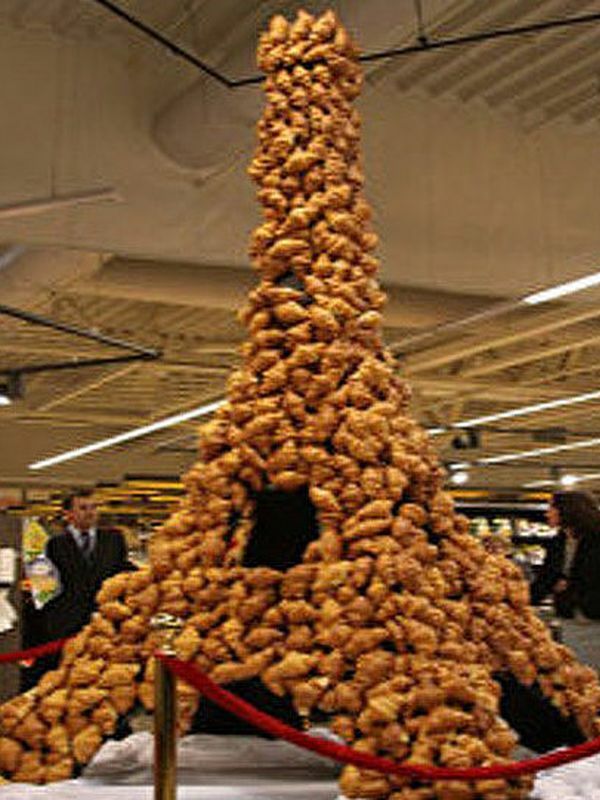 Yes, you are not dreaming: This Eiffel Tower is well made of croissants! 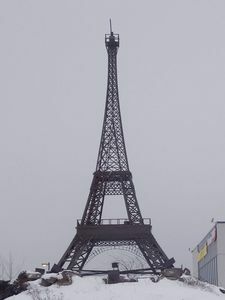 It was the idea of a shopping center in Vilnius, Lithuania, that offered visitors a croissant from this tower specially designed to celebrate, in October 2011, the days of France. 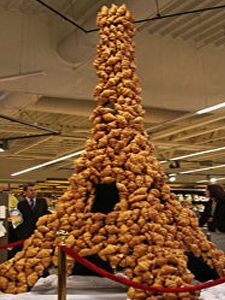 It's very original, as an idea ... To make this ephemeral Eiffel Tower, it took 1500 croissants, made from 50 kg of flour, 30 of butter, and 30 liters of milk. 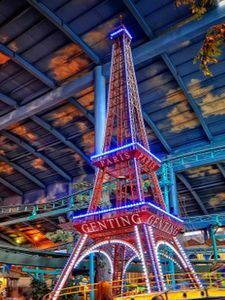 In Malaysia there is another copy of the Eiffel Tower, it is in the largest shopping center of the city, the "First World Plaza Shopping Mall", in the Genting Highlands. This gigantic mall is home to many shops, but also attractions for children, history they also find their accounts during their parents' shoping days. 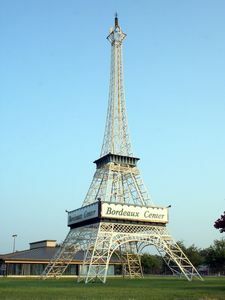 One of these attractions, as the picture shows, is accompanied by an Eiffel Tower on which one reads "Paris". It is quite simple, not very high (about ten meters anyway) and it is relatively well done, if you do not look too closely. Painted in red and covered with loud lights, we have a little trouble recognizing it, anyway. 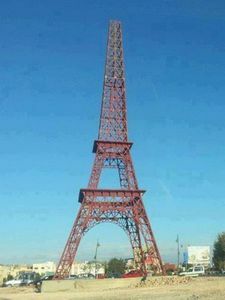 This image shows the Eiffel tower in the marociane city of Fes. My municipality had it built to prove his friendship with the French. It is located along Boulevard Mohammed VI. When this photo was taken the tower was not finished yet, but now it's done. She took a bronze color equal to that of the real tower, and her campanile was laid. The proportions have unfortunately not been fully respected then the first floor is too high, and the base of the tower is too narrow, the real Eiffel Tower is more flared at its base, which allows him moreover to have decorative arches more visible than here. Also note the abnormal feeder of the pylon, ie the part that becomes common to the 4 pillars. Then the floors have little realism, but we can imagine that it is due to the fact that it is not finished. 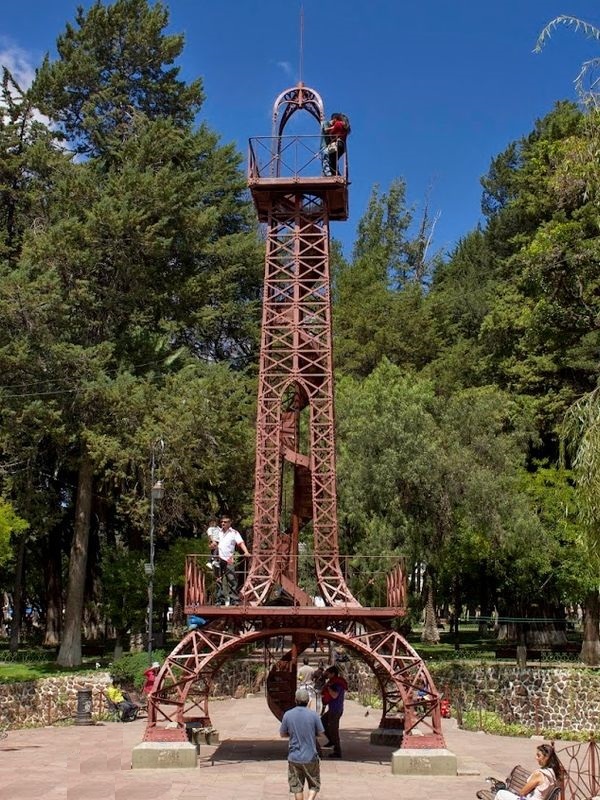 At Gómez Palacio, in the state of Durango, Mexico, you can find this magnificent Replica of the Eiffel Tower. 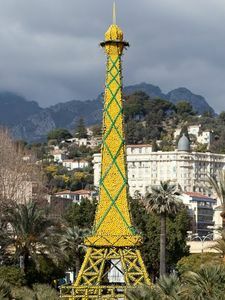 With its 68.5 meters high, it is a gift made by the French community to the city that dates from 2007. This copy is very well made, it perfectly resume the curvature of the pillars, the proportions of the floors and even their decorations, which is quite rare. The pylon, which is the upper part of the tower, is also quite correct, and that up to the 3rd floor, well taken again. There is little to blame for this copy. 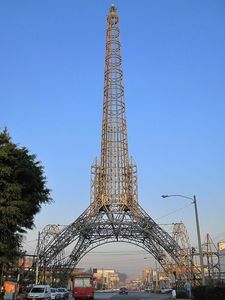 This Replica of the Eiffel Tower is in Guadalajara, Mexico. It is approximately 20 meters high and is located on the forecourt of a church, on the outskirts of a street in the suburb of Barranca de Oblatos. This is more of a structure inspired by the Eiffel Tower than actually a copy, we can see common points but no real intentions of a perfect reproduction. 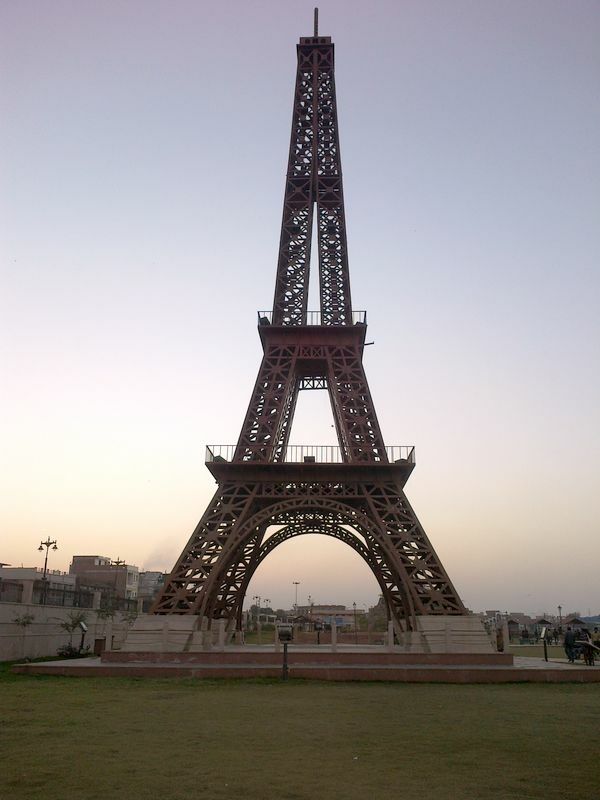 There are many places on Earth where you do not necessarily expect to find a copy of the Eiffel Tower ... And yet, even in Pakistan there is one. It is in the city of Bahria Town that it is located, in the province of Rawalpindi. It is very large because it measures 80m high, a scale of one quarter. Built in 2014, it is relatively faithful to the original. We do not know the reason for its construction, but we can not complain about the amount of defects it has ... It seems relatively well done. The proportions look good, and the floors are well arranged. The first is approximately well reproduced, these white plates should be only protections due to the construction, and the 2nd, if it is not yet finished at the time of the shooting, is correct. On the other hand, if it is finished there will be a problem of conformity. The top of this tower is quite original and also inconsistent. 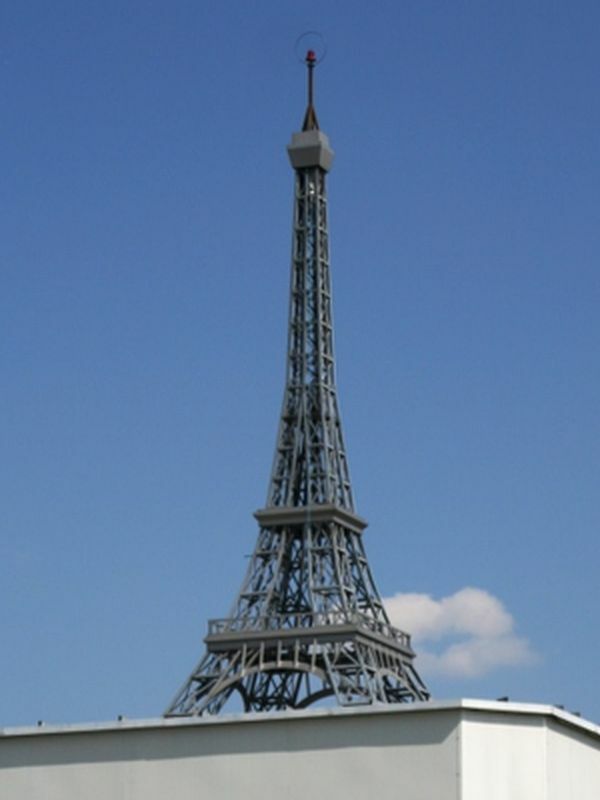 This copy of the Eiffel Tower is original in its color, white. 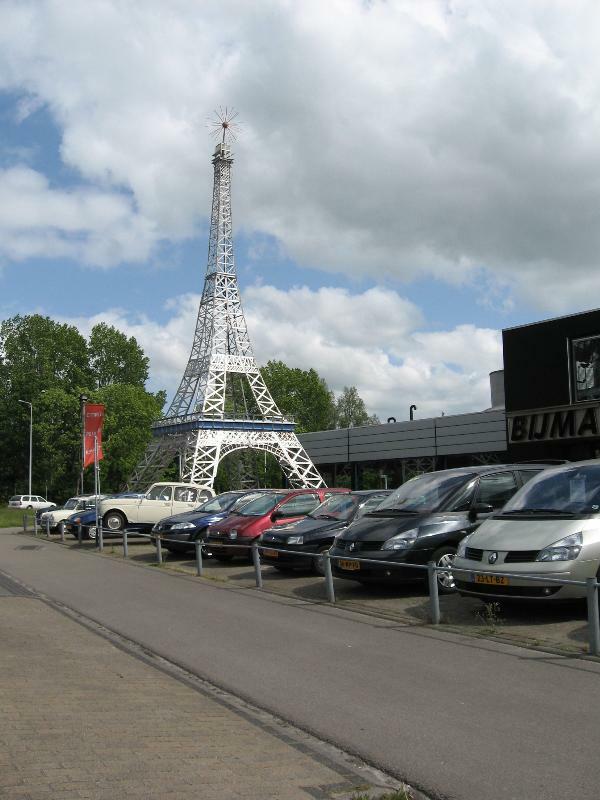 It is located in the Netherlands in the city of Friesland, in front of the Renault car dealership. It was probably put here to recall the French origin of the brand. This is not a perfect copy, it has a little too much defect, despite the obvious good will to make it the best possible. It is a little too flared, so that it looks like it should be a little higher, a little more stretched. The first floor is not bad, with a kind of grid on the 4 sides, just below, and the caissons taking the names of the 72 scientists (who are not registered, do not exaggerate ...). The second floor, more complex to build because of the height, is rather poorly done, it is a simple grid added to the pillars. By cons the summit is not bad. Note that the top of the antenna has a sort of star that makes it rather original. This copy is in the Philippines, on Boracay Island. This island is relatively touristy, made as often of paradisiac beaches and luxury hotels disfiguring the littoraux. One of the restaurants on the island is run by a Frenchman, the restaurant is called "La Réserve". 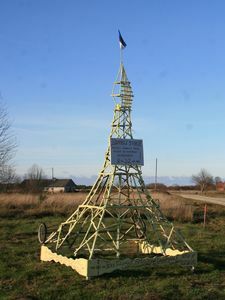 To mark his affiliation with France he has installed this copy of the Eiffel Tower of about 3m high which is perched on a small flat pedestal in the name of the sign. This tower is well reproduced, it is really pretty. 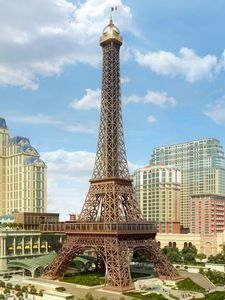 Obviously it can not be perfect on a model as small, for example the floors are just marked, and the pillars are flat (They have only two sides) while the Eiffel Tower has pillars shaped boxes (superimposed blocks). But apart from that the copy is really well done. This copy of the Eiffel Tower is in the Philippines, in one of the shopping centers, the Megamall. This gigantic temple of consumption has set a time replicas of European monuments. 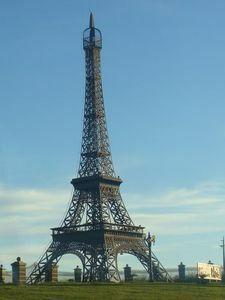 Some facades of western cities adorned the walls, and a large Eiffel Tower sat in the center. High of approximately 15m, it was very well reproduced, with correct proportions. One could just criticize a little the curvature of the pillars that had not been respected, as well as the 3rd floor, rarely reproduced well. 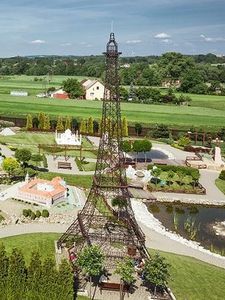 This copy of the Eiffel Tower is in Poland, in the amusement park "Swiat Marzen" Inwald which presents the monuments of the World in small format. It is a fairly classic concept, it is found in many countries. The Eiffel Tower is presented next to the Statue of Liberty and Doge's Palace in Venice. The problem is that this tower is not very similar. The general shape is well made, the curvatures are correct and the floors are approximately well arranged, but it has two big defects. On the one hand the metal rods are much too thin, giving it an air of wire structure, on the other hand the floors are only underlined instead of occupying the space of the tower. The result is not very brilliant: It is recognized without problem, but we can not speak of real copy, for this one. It is in the city of Gliwice, Poland, that is this pylone that is sometimes compared to the Eiffel Tower, hence its presence on this page. 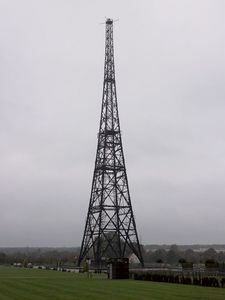 It is a pylon of radiotelecommunication very known in the region for two reasons: On the one hand, it is about the second highest wooden construction of the world (118m), on the other hand it played a important role during the Second World War. Indeed, it is from here that a message was sent informing the staff of the German invasion on the territory, in 1939. It was built in 1934 and for the skeptics, yes, it is wood, this pylon, despite what you might think looking at the picture. This station is now a museum since January 2005. 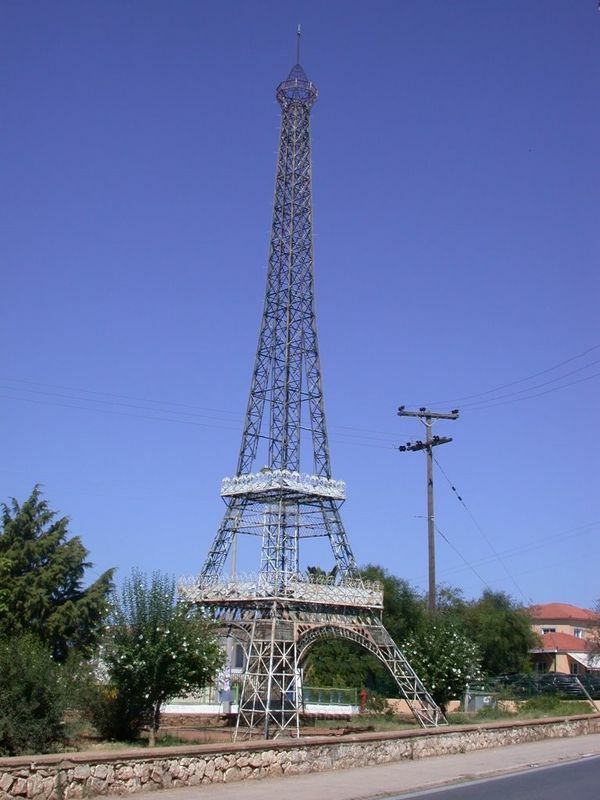 This imitation of the Eiffel Tower is located in Portugal, north of the city of Leiria. The reasons for its existence are unknown, especially as it is in a roadside field, in an area apparently not very crowded. This tower is well done, nothing more. The curvature of the pillars is correct, as well as the layout of the floors and the bracing of the caissons, but precisely what gets stuck is that there are no caissons here. 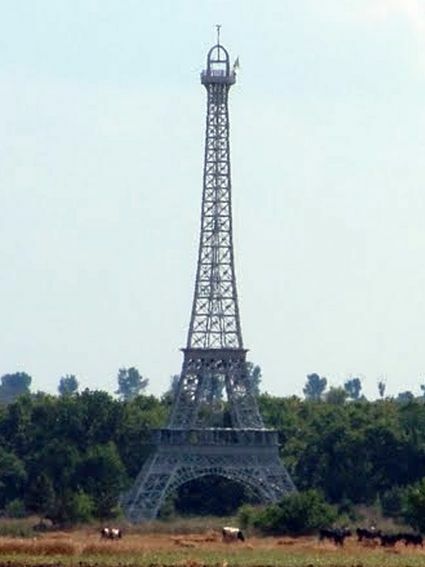 Remember that the real Eiffel Tower is a superposition of 30 paralellipipedic caissons whereas this tower has pillars composed of two sides only. Note, however, that this is quite common, as an error. Otherwise, the decorative arc of the first floor is not pronounced, and the floors are just marked, not really materialized. And finally a note: The third floor, it seems quite well done while paradoxically it is often he who is sloppy, on a reproduction of the Eiffel Tower! Petrin's tower is in the Czech Republic, in Prague. There, it is called the Petrínská rozhledna. Measuring 63.5m, it is approximately at a scale of 1:6th. 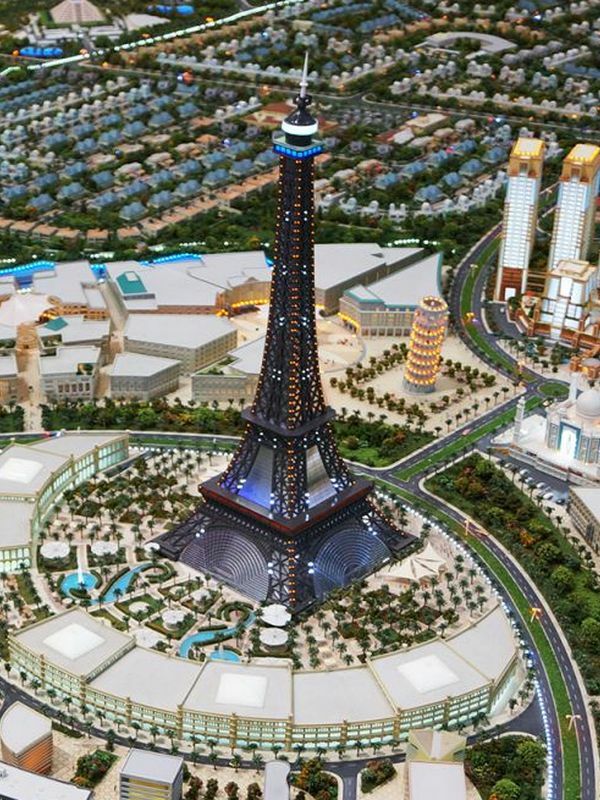 It is not a replica strictly speaking but it is technologically inspired by the Eiffel Tower. Indeed, they share this metal construction made of braces maintaining a vertical architecture going in decreasing width. Another common point is that the 2nd and 3rd floors of the Eiffel Tower are similar in layout to the two floors of the Czech tower. 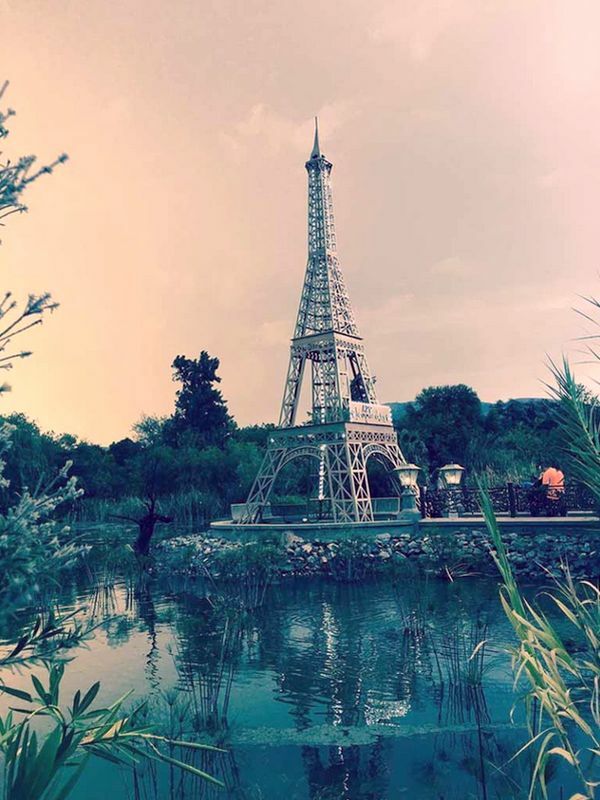 But the resemblance stops there because it is actually made of a cylindrical pylon surrounded by a metal frame and it is octagonal, where the Eiffel Tower has a square plan. This tower seems very similar at first glance, but in fact it differs a lot from the Parisian tower. Still, this tower does exist, and apart from the third floor, made in the form of a small platform instead of a larger rectangle as on the original, there is has little to say. It is 54m high, so it's a ladder at 1:6th. 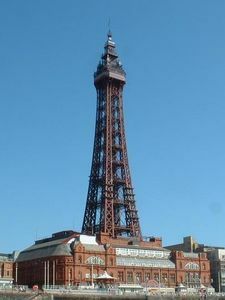 Unlike the New Brighton tower, the Blackpool tower is much more similar. It was built by the Isle of Man's Standard Contract and Debenture Corporation, which proposed to erect two towers: one at Blakpool, the other on the Isle of Man. But the company had difficulties and had to build only one, so this one. 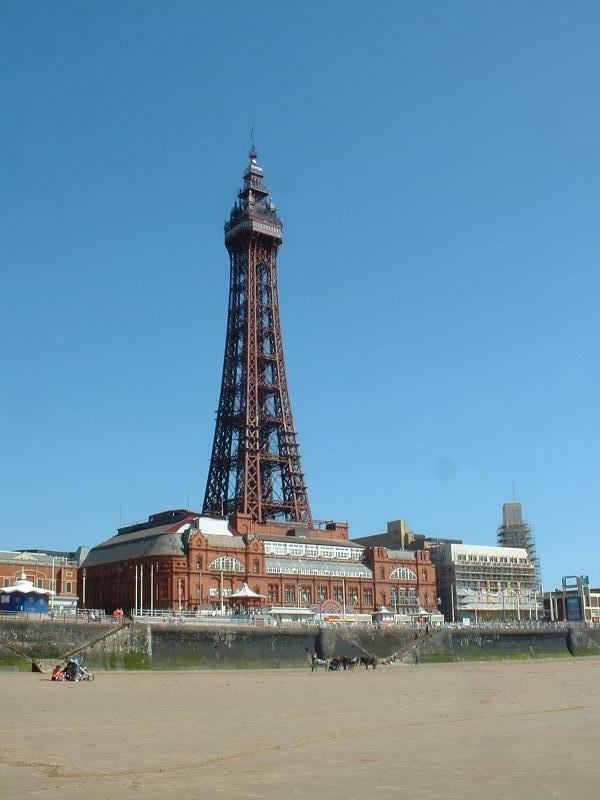 It was designed by architects Maxwell and Tuke, who had worked together for the New Brighton tower. This tower is quite similar to the Eiffel Tower, or rather it is a mix between floors. Indeed, like the Eiffel Tower, it has 4 pillars that rise to the sky curving. Like it, the pillars are composed of a square cross-section, regularly associated with the other pillars by horizontal sets of spacers. Like her, her upper floor is a large rectangle containing an observation gallery and radio and television antennas. But it differs in the fact that the Eiffel Tower joins its 4 pillars at the 2nd floor, while here they do not join, as if there was a mix between the first 2 floors and the 3rd. 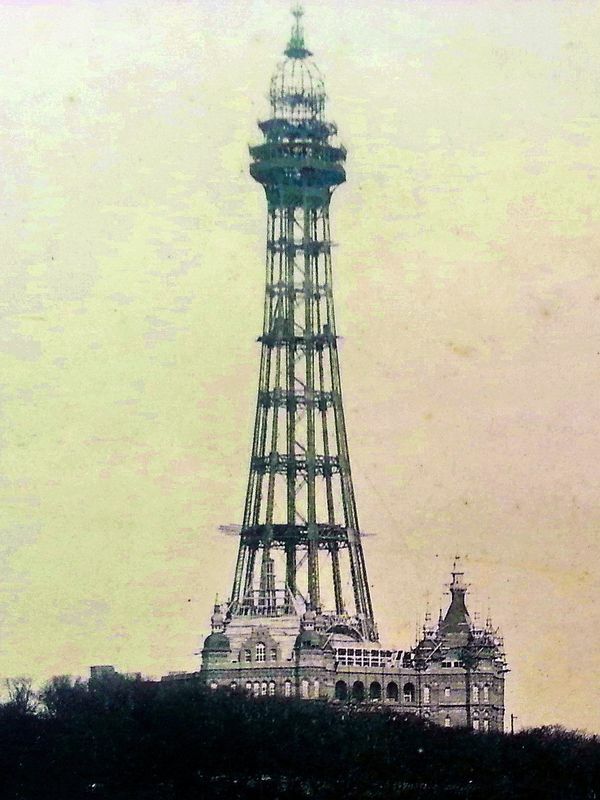 The New Brighton Tower is a tower in New Brighton, Merseyside, UK, as its name suggests. It does not exist nowadays. 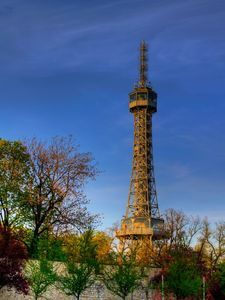 Its construction was completed in 1900 and it was demolished voluntarily in 1921, so it is quite contemporary to the Eiffel Tower. 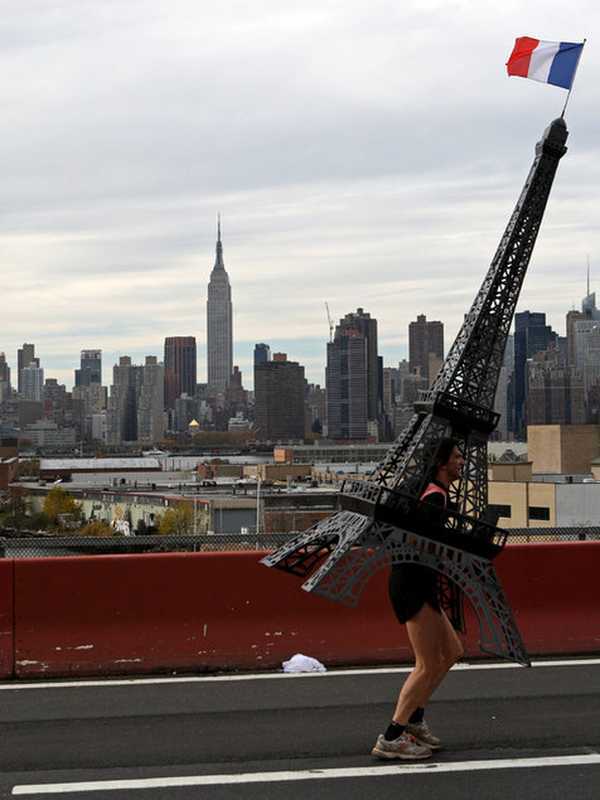 Measuring 173m tall, more than half of the Parisian tower, she has only a vague resemblance to her. It has 8 pillars joined by regularly spaced platforms which leads to a floor serving as an observation post. 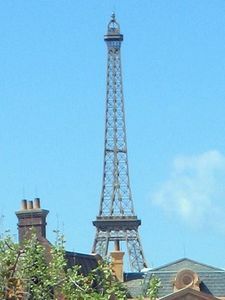 The resemblance to the Eiffel Tower lies essentially in the adoption of an arched campanile, as was the case at the time for the Eiffel Tower. The English have few memories of this tower. The Watkin's tower is a tower that was originally supposed to be taller than the Eiffel Tower, it was to measure 350m high. Coming out of an international competition with some particularly crazy proposals, it was Watkin's project that stood out. It must have been an octagonal tower but at the time of construction the calculations were redone for a square-based tower, like the Eiffel Tower. Construction began in 1891 but it stopped as the first floor was built, for some reason. In 1907 this structure was demolished. It was built in Wembley, a suburb of London. For more information, visit the this page. 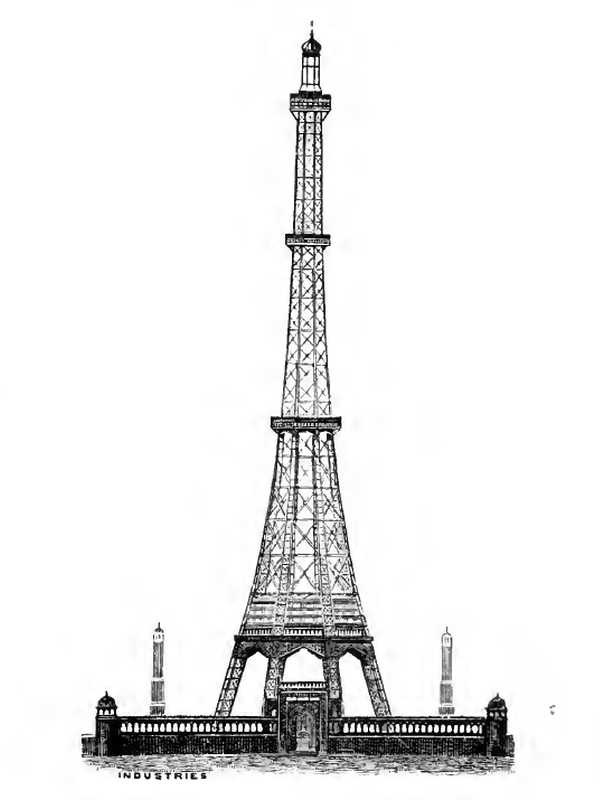 This copy of the Eiffel Tower is as beautiful as incongruous. We are in Abakan, Khakassia, in Krasnoyarsk territory. 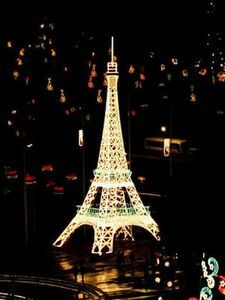 This city has in its heart a garden with a large white Eiffel Tower which we do not know everything: Origin, construction, symbol, etc. Still, it is pretty well reproduced, and that the white color is rather original. It is intended to be a perfect copy, they even reproduced the 3 floors in a manner almost correct, with the exception of the 3rd, which does not stand out of the void as is the case on the original tower. The lower part of the tower, too, is a bit too flat to look like the real Eiffel Tower. It is also unclear what great cables can be used from the top to the ground. 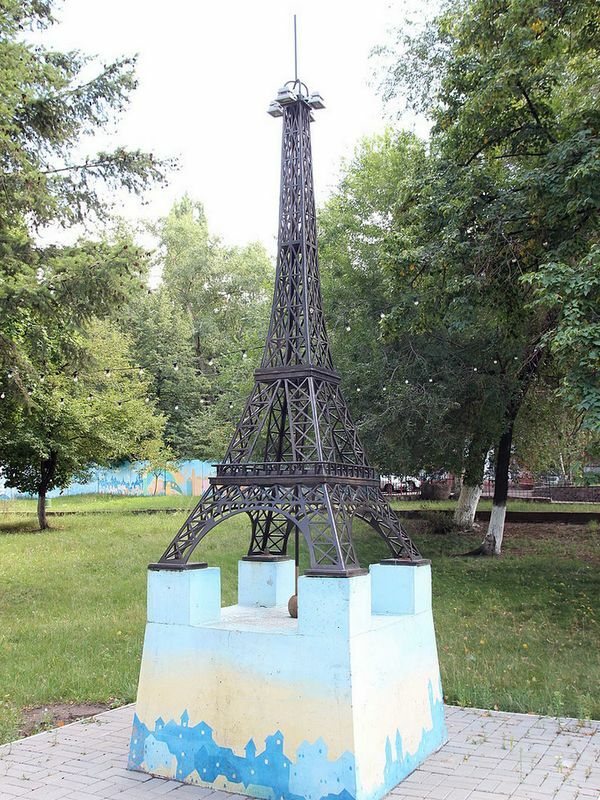 The city of Irkutsk, Russia, also has a copy of the Eiffel Tower, but there are currently no photos available. It is metal, rather well reproduced, for a height of approximately 3m. She is on the pavement in front of a French cafe. 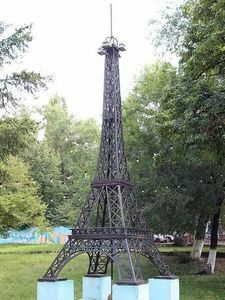 This copy of the Eiffel Tower, very well reproduced, is in the city of Nikitin, in the province of Voronezh, Russia. It is exposed as a statue, on a pedestal made to its dimensions, in front of the gymnasium of the city. It is 3n24 high, 1% of the height of the original tower (scale 1/100 th). This reproduction is quite pretty, it is perfectly built, with a correct scale. It is lit at night by 4 small projectors that were installed at the top, under the campanile (which, him, is pretty missed ...). Note that the base is painted with the same patterns as the walls of the gym and the wall, which is rather original. 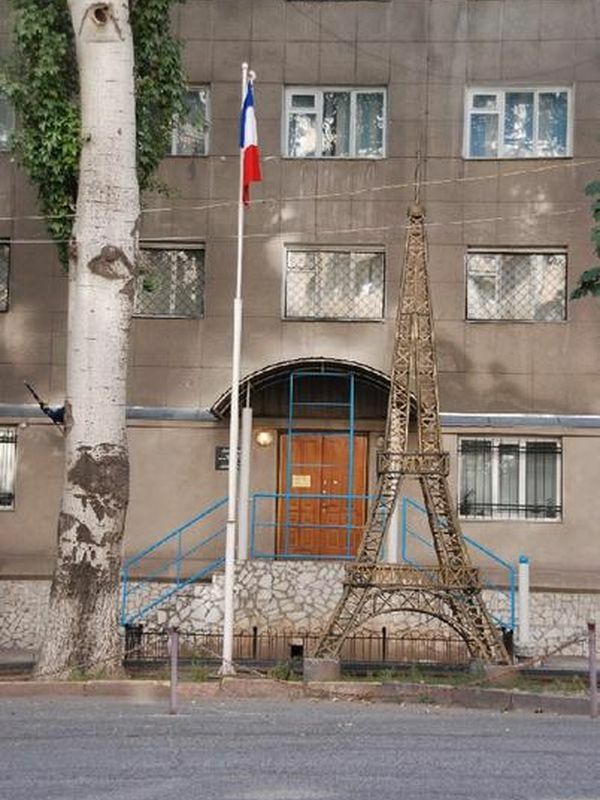 In Parizh, Russia, when the Russians want to build a telecommunications pylon, they do not forget that the city bears the same name as the French capital ... Parizh = Paris, in Russian) Hence the rather incongruous presence of this pylone shaped Eiffel Tower. But for a pylon, it is rather very well reproduced: Proportion respected, curvature of correct pillars, many braces, etc. We are not talking about an attempt at perfect copies because the designers of this tower did not intend to reproduce the 3 floors, but they still materialized. 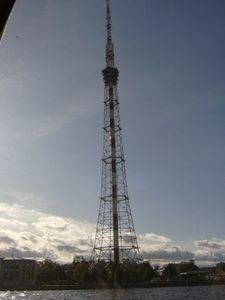 The summit is equipped with telecommunication antennas used for mobile phones. 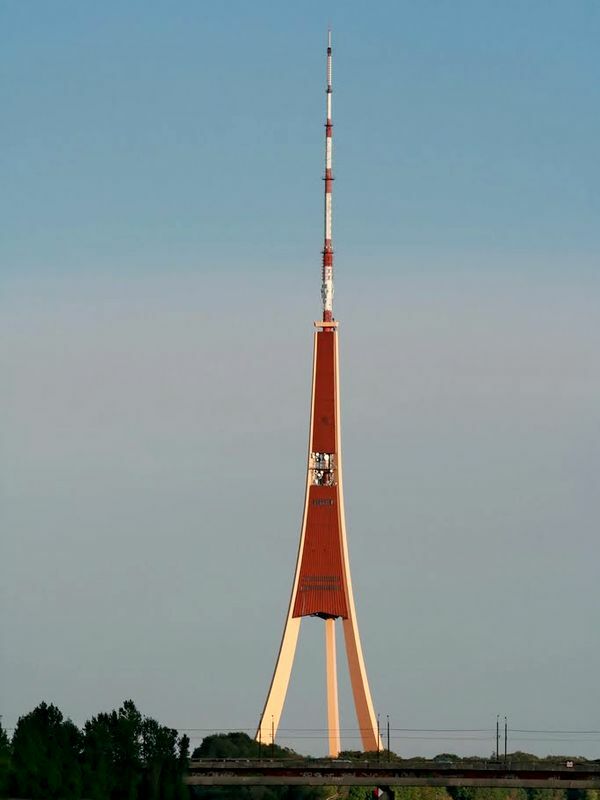 Built in 2005 by the South Ural mobile phone company, it is still 50 meters tall, a scale of 1/6 th. 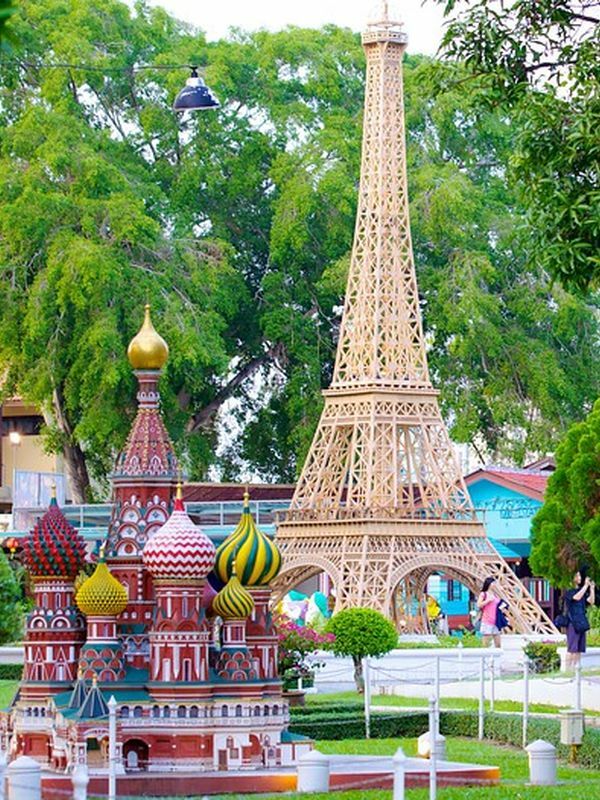 St Petersburg, Russia, boasts of having a Replica of the Eiffel Tower. This is obviously an opinion shared by many people on the Internet, that's why it is mentioned here. But as much to say it immediately: There is nothing in common with the Eiffel Tower, according to me. It is a large cylindrical pylon surrounded by a light conical structure. 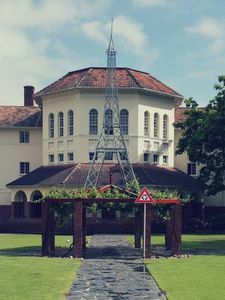 It is the presence of this structure vaguely reminiscent of the Parisian tower, as the upper floor below the disproportionate antennas that we see in this photo. 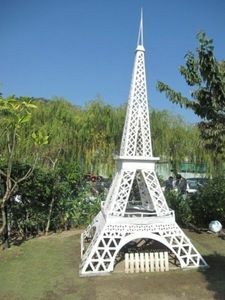 The city of Taïchung, Taiwan, has in the garden of a restaurant a beautiful Eiffel Tower ... cardboard. This material is rarely used because it does not lend itself to fine cuttings that a copy of such a building requires. Not to mention that the interview is probably hard to do. This is painted white and sits near a pond. His reason of being ? The restaurant is run by an environmentally-conscious owner, and he has made sure that everything in his restaurant is made from recycled cardboard. And it works ! Tables, chairs, furniture, decoration, everything is actually cardboard. 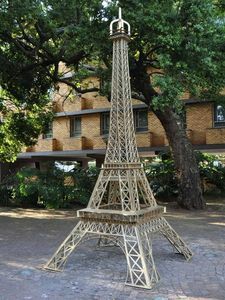 In the garden he had a copy of the tower of Pisa, and this copy of the Eiffel Tower, still cardboard. This proves that using recycled material is possible! The capital of Taiwan, Taipai, is a sprawling city. It does not escape the presence, in its streets, of a copy of the Eiffel tower. This one is not especially well done. She is on Chung-Shan North Avenue where there are many stores to prepare for her wedding. In the eyes of the Taiwanese, Paris is the capital of romanticism, no wonder that the Eiffel Tower was used as a symbol for a store specializing in wedding items. Aesthetically there is still a lot to say, even if this picture does not show much. 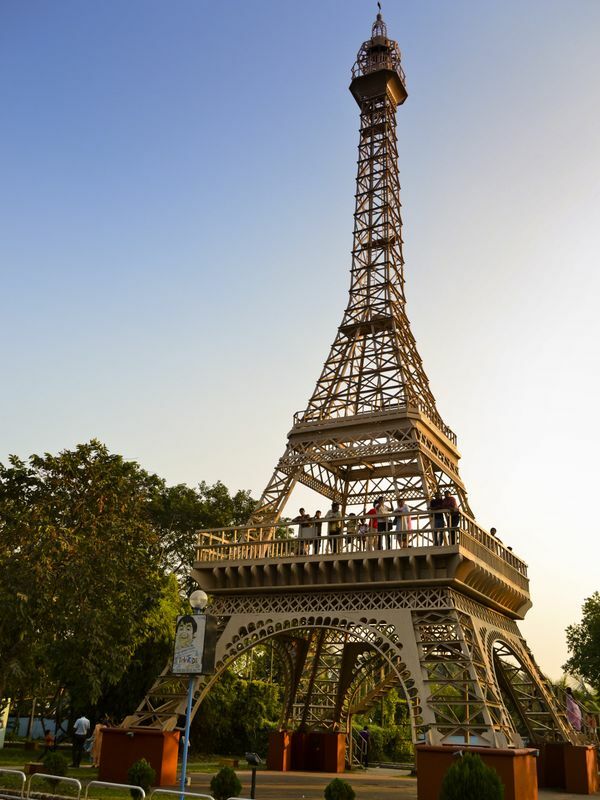 It is clear that it is not intended to perfectly imitate the Parisian tower, it does not have the right curvature, and its first floor is almost nonexistent. But more than the precision of reproduction, it is the symbol that is important here. Switzerland was one of the first countries in the world to have a Replica of the Eiffel Tower. She was assembled on July 31, 1889 in Eschenberg, a small village near Winterhow. It measured 33 meters in height and the point of view that we enjoyed was, it seems, magnificent. The ascent is via a staircase of 146 steps. Built of iron, this tower cost 12 000 francs at the time. But nowadays it does not exist anymore. 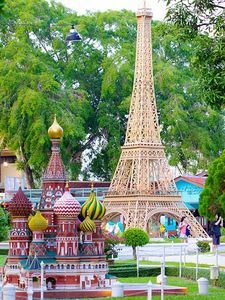 In Thailand there is a park called "MiniSiam" which offers to walk between models of the main monuments of the world. Of course the Eiffel Tower is present as seen in this photo. 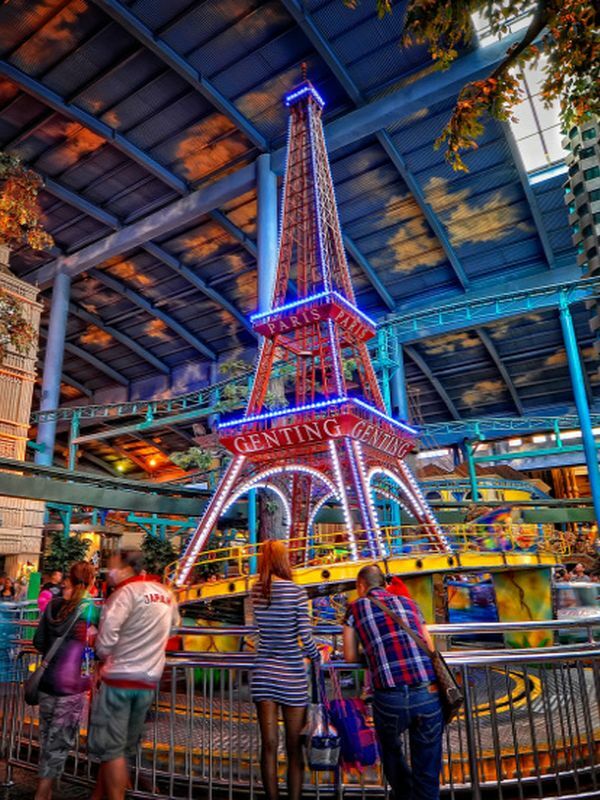 This type of amusement park is quite common in the world, it is found in several countries. 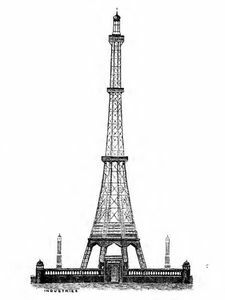 This reproduction of the Eiffel Tower is rather successful, it is well proportioned, with perfectly marked floors and correct decorations. The top of the 3rd floor is a little flattened, it lacks the technical rooms, above the gallery of visitors. In addition the entanglement of the spacers is well reproduced, this copy can claim the title of most beautiful imitation of the tower in the world. A full success. 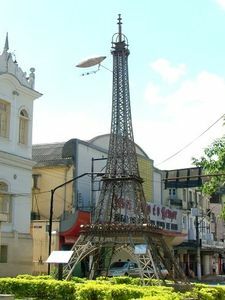 Thailand has in the city of Udonthani a rather original Eiffel Tower. It is on a small square, outside a shopping center. It is relatively large, rather massive, and seems to be made of fabric on a metal frame, and the two floors are underlined by two rows of bulbs. The city of Kharkov, Ukraine, has a very nice Replica of the Eiffel Tower. 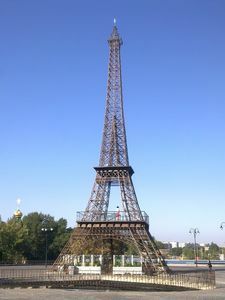 Kharkov is a fairly large city, the tower is in the city center near the Café de Paris, a French establishment. You can climb on this tower, it offers an interesting view of the surroundings, especially the parking just below where the day passes through a hole ... heart-shaped. 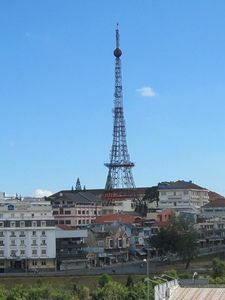 Vietnam also has a copy of the Eiffel Tower. It does not want to be a perfect replica, it's just a large telecommunications pylon with a pyramidal shape. 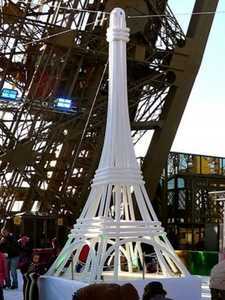 It shares with the Eiffel Tower curved pillars, 4 pillars and floors well marked. By cons it is much too thin, the materials used are too thin too. It is equipped with telecommunication antennas of course, which are curiously placed on a sphere. It probably contains a pivotable satellite dish. 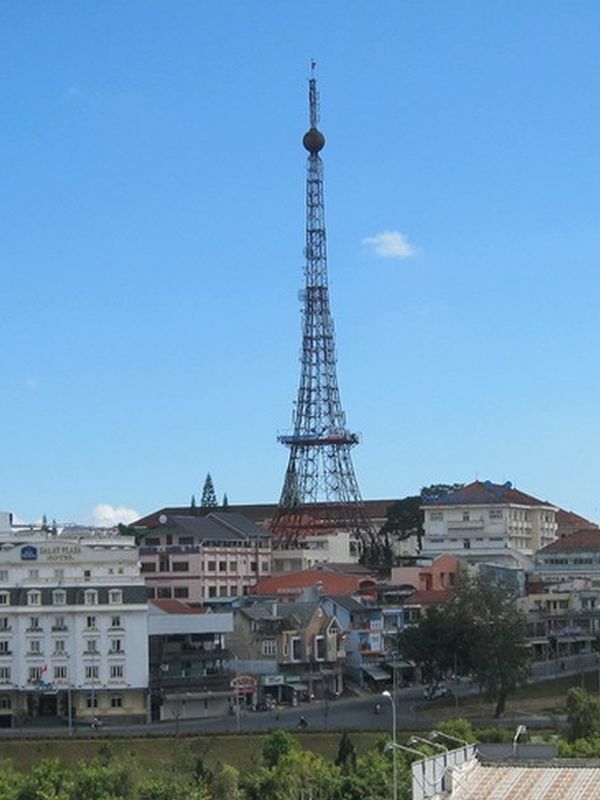 This tower is placed right in between Da Lat.